I love Shore Road. I’ve spent my whole life, from boyhood to adulthood, wandering its twists and turns. When I was a teenager, I’d fantasize about dying young, and my friends stealing my body and burying it on the hill overlooking the 75th Street ballfields, something like Gram Parsons in Joshua Tree. The park today is one of the prettiest spots in Brooklyn, with its views of the Narrows, the glittering lights of the Staten Island hills beyond, the tree-lined paths and open-park vistas. It’s an almost unbroken chain of greenspace along more than two winding miles from Owl’s Head to Cannonball Park—a marvel of outerborough open-space preservation. But then there are the drawbacks—the hulking apartment buildings along most of it, the stream of speeding automobile traffic, the aesthetic blight of parked cars, the impossible-to-block-out grumble and glare of the omnipresent parkway. Shore Road is pretty, but it could be a lot prettier. 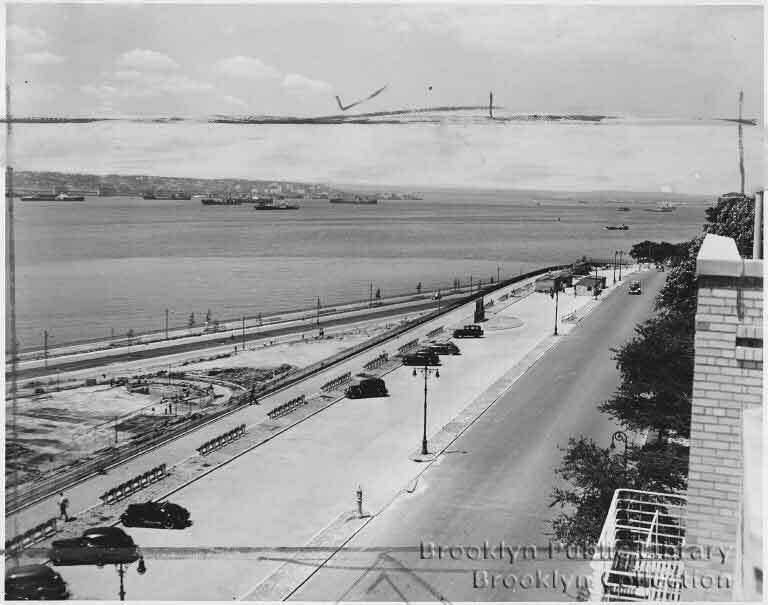 Of course, it once was—the shorefront and the tortuous path that followed it were large parts over the past few centuries of what drew countless throngs of homesteaders, vacationers, boarders, millionaires and eventually developers to this part of Brooklyn. Looking at Shore Road today, we can barely even imagine what was lost. Public and private builders destroyed the majesty of the original shore and its road, leaving behind a ghost of its once-stunning natural beauty. All we have left is a stone-covered, car-choked imitation; if it impresses us, it’s just because we don’t know anything else. Not even surviving old photographs can truly capture what was lost, in part because significant transformations began in the mid 19th century and most of the earliest photos are from decades later. But also because Shore Road can’t be summed up by a stationary glimpse of a combination of homesteads, jetties, shacks, trees and shoreline. It needed to be experienced in sum by moving through it; its magic lay in the sum of ever-changing details—light and air and odors. This is the story of what Shore Road was and what it became, of a century or two of people trying to make it better but only making it worse. Henry Ward Beecher, 19th-century Brooklyn’s rockstar abolitionist preacher and notorious adulterer, was positively rapturous about Shore Road in a chapter of his 1855 book Star Papers, a collection of his columns in the New York Independent, called “A Ride to Fort Hamilton.” In it, his family gets in a carriage on an early autumn day, leaves their home around Brooklyn Heights, travels past Gowanus and Green-Wood and turns into Bay Ridge. We…hasten toward the water. The way is narrow, the road smooth, the sides hedged with trees and bushes and many evergreens intermixed. We emerge. There lies the narrowing Bay. Up through the Narrows come the weary ships that have struggled bravely with the ocean, and are come home to rest. They look grateful. Their sails are loosely furled. They submit themselves to steam tugs with a resigned air, as if it was fit, after so great a voyage, that they should rest from toil. Down come ships from the city, some with sails and some towed, but all eager, fresh painted, vigorous in aspect, and ready to pitch into storm and spray. Little boats skip about like insects. Sloops and schooners, with snow white sails, are busying themselves with just as much self respect and look of usefulness as if they had the tunnage of the hugest ship! As we draw near the Fort, the lower bay opens. Shadows divide the light into sections along the surface. The whole expanse is full of little undulations that quiver and gleam, as if from beneath the water myriads of fire-fish flashed their light. But all these things we see the more thoroughly when we return. Now the eye searches the horizon. There are the faint ships dying out of sight, outward bound. That speck yonder, far in the horizon, is not a ship—but a mote such as dances before the eye strained to penetrate an empty distance. Yet a little while, and it has the semblance of a cloud. It gathers substance before you and, ere long, swells its airy proportions into the undoubted form of a ship carrying every bit of sail that can be made to cling to the spars! We turn the carriage from the road; we grow silent and thoughtful; we gaze and think. We fly away from the eye and see the world beyond the horizon; we hover over ships upon the equator, we outrun the Indiaman, and double the Horn; we dart away westward and overlook that garden of islands, the Pacific! If one speaks, the charm breaks, the fairies fly, the vision is gone, and we are back again! Now you may see that noblest of all ocean sights for beauty, a full-rigged ship under full sail! A man that can look upon that and feel nothing stir within him, no glow, or imagination, or sense of beauty, may be sure that something important was left out in his making. If you come down here a hundred times, it is never twice alike. The diversity is endless. Its population of sails changes; every veering of the wind, every mood of the atmosphere, every mutation of clouds, every changing hour of the sun, give new aspects. It arouses in you an idea of infinity. As you look the serene ocean of ether and the tremulous ocean of water, both and alike, give inspirations. You forget; you let go of care; you drop sorrows; all threads of thought snap in the loom, and the shuttle carries a new yarn and the fabric stretches out a new pattern. God’s truths, that came near to fading out among the clang of men and the fictions of the real, gain form and power. The Invisible grows more real than the substantial. Nothing seems so wild and extravagant as human life; nothing so sweet as flying away from it. The soul hears itself called from the other world. Nor does it require that supremest architect, the imagination, to fashion forth the illustrious gate and the blessed City;—not, if your ride be at evening, and the sun sets enthroned among high piled and multitudinous clouds. Then the eye beholds things unutterable to the tongue. How restful is all this! Irritableness and impatience are gone. The woes and frets of life are not then hard to be borne. To live for the things which occupy God; to lift up our fellow-men, through all the round of human infirmities; to build the substantial foundations of life to enrich the conditions of society, to inspire better thoughts, to fashion a noble character, to stand with Gospel trumpet and banner, and see flocking toward it troops of regenerated men, who, ere long, shall throng about our Lord, the Christ of God;—these seem, then, neither unsubstantial ambitions nor impracticable works. At other times, among giddy excitements, nothing seems so unsubstantial and visionary as the impress of your labor upon human hearts. But now, and here, nothing seems so real as that which God gives the soul power to do upon the soul. The tide that came down with us is returning. Ships that dashed out toward the sea are slowly coming up to their anchor, and swinging around toward the city. Let us return, for we have flowers to gather along the banks, and crimson leaves, and branches of cedar clustered full of pale blue berries, and creeping strawberry vines. We must clamber down, too, to the rocks, and let the water lick our feet; and gather a few choice pebbles, which our children, at least, will think pretty. 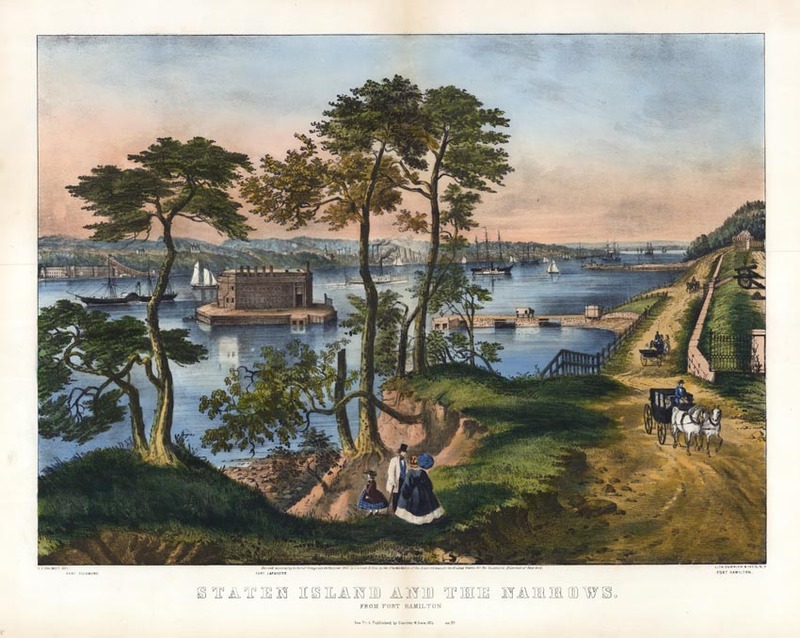 “I was particularly struck with the romantic and picturesque scenery, and astonished that so beautiful a section of the country had been so long lost to the public for want of convenient access,” wrote a letter writer about Shore Road to the Long-Island Star in 1834. Let those who visit foreign countries, for the purpose of beholding the beauties of landscape scenery, take first one view of our unrivalled bay as presented from the road to the Narrows; and those who fly from our city to Newport, for the benefit of pure atmosphere and sea bathing, recollect that they may enjoy all those comforts in a far greater degree, within sight of, and within 15 minutes ride of their own proud city. I prophesy that this is shortly to be the most fashionable summer residence and watering place in the world. 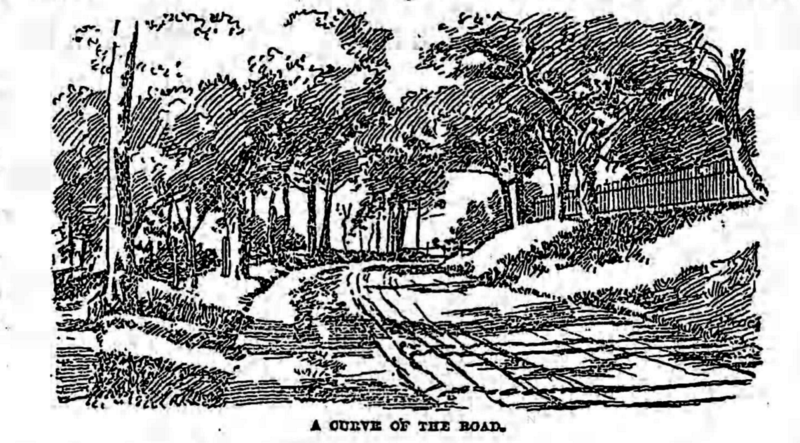 More prosaically, an 1847 description, Shore Road’s first mention in the Brooklyn Eagle, called it “one of the most agreeable drives that we know of” and mentions that “the south breeze which always sweeps up from the waters affords a delicious coolness.” An unsigned portrait, in the Brooklyn Eagle, in 1890, describes the landscape. 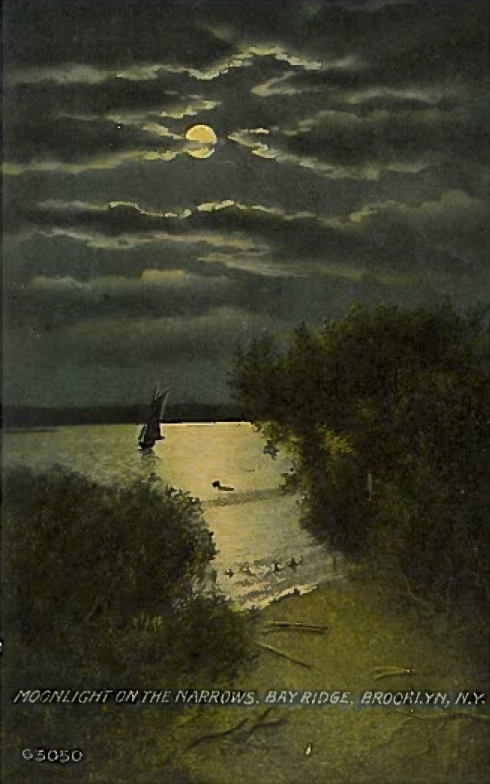 The bold bluffs are clothed with verdure from the murmuring waters of the upper bay to their summits…this portion of the Long Island shore possesses a soft and romantic beauty all its own…When the Narrows is reached [along the waterfront from the south] the entire character of the shore changes. The salt breath of the lower bay assumes the softened breezes of an inland lake. Opposite Fort Hamilton the wooded hills of Staten Island present an aspect of softened beauty rarely seen so near the sea in a northern clime. But already, in 1890, this writer could sense the coming destruction. The wild vine, the Virginia creeper, and the wild convolvulus embrace these trees in a tangled mass of verdure that may soon pass away to make way for the speculator and the contractor. The clink and clang of the mason’s trowel and hammer and the treat of the hod carrier will too soon usurp the whispering winds that make æolian music to every ear attuned to other sounds than the clink of dollars. As the march of empire westward takes its way, so, too, the ever increasing spread of Brooklyn reaches out to embrace this loveliest shore. A few short years and the influences named will have wiped away every trace of the historic past along this romantic shore. The bold bluffs will be leveled into terraces to meet the views of men of narrow minds. The sweetest dales and woods of Long Island will be cut into lots—corner ones, especially—by some improvement company, and suckling statesmen, yelept [?] aldermen, will wrangle over and sell to the highest bidder all and every right to run railroads here and there and everywhere through the fairest scenes on Long Island. Call it sentiment if you will, but the records of the world’s history would have been lost but for some such feeling…The men who in a year or two will traffic in corner lots on the Bay Ridge shore neither know nor care for the history of the past. The beauties that will disappear with the incoming horde of speculators and hod carriers they never will or can comprehend, and these beauties will be lost forever. 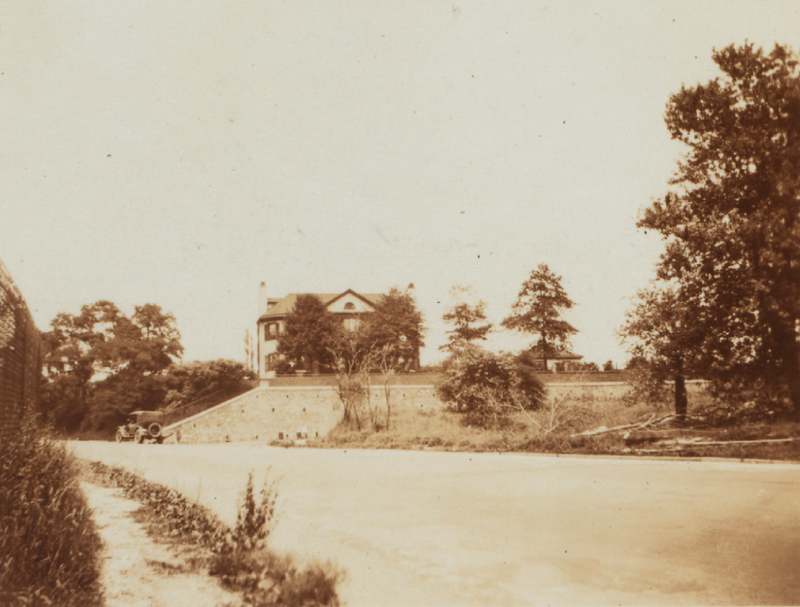 The earliest known mention of the Shore Road was in 1715, less than 100 years after the first Dutch settlers arrived; it extended from 69th Street (then Bennett’s Lane) to Dyker Meadows, now part of the armybase but then just south of it, about where the old Donnybrook Hotel once stood. It was 22 yards wide—today’s Shore Road is closer to eight, sidewalk to sidewalk—and ran along the riverbanks. 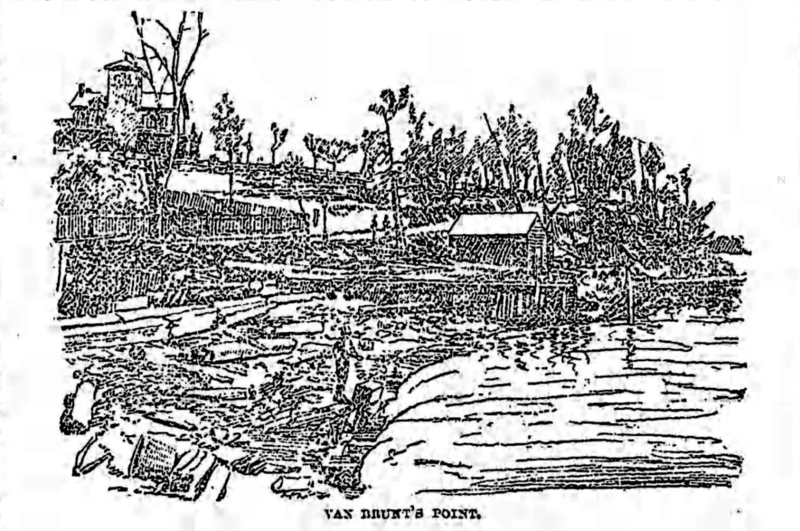 An earlier road ran from about 79th Street, the edge of the Van Brunt property, to George Gelston’s property, way down by 99th Street. 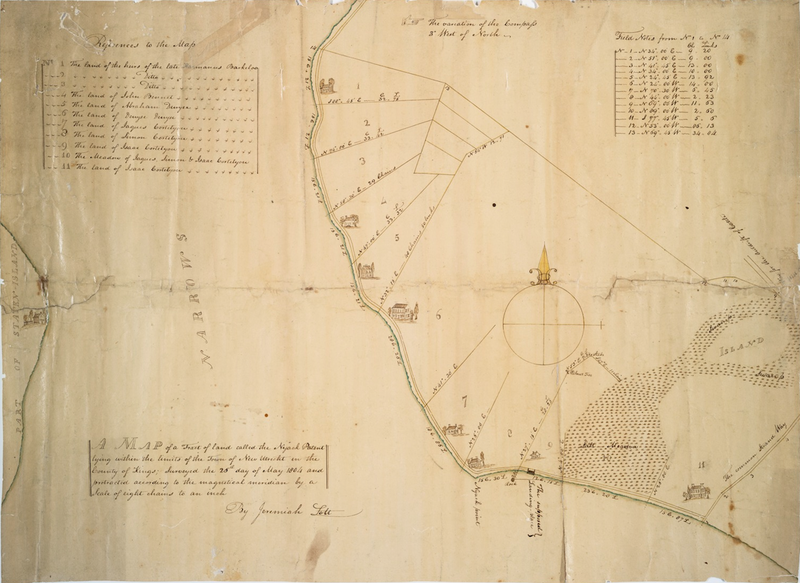 An 1804 map of “The Nyack Patent”—a portion of the Town of New Utrecht, encompassing Yellow Hook/Bay Ridge and what would become Fort Hamilton Village, taking its name from the indigenous peoples—shows just eleven plots of land from roughly what’s now Owl’s Head Park to past what’s now the armybase, and only eight houses along the shore belonging to just four families—Barkeloo, Bennett, Denyse and Cortelyou. By 1873, a different map shows dozens of homes along Shore Road, belonging to dozens of families. 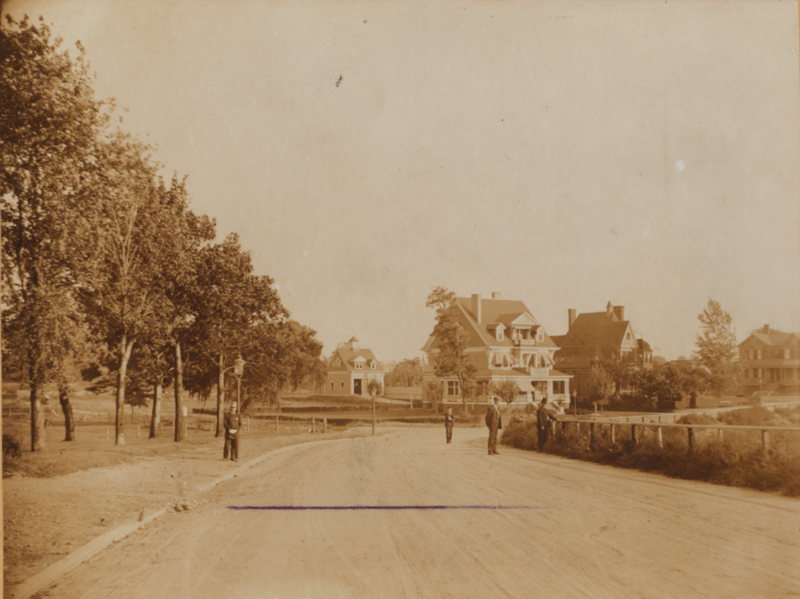 During the middle of the 19th century, wealthy men came to Bay Ridge and built themselves mansions; compared to the cities of Brooklyn and New York, this was still restorative countryside, a remote getaway. The population of the town of New Utrecht—including Bay Ridge and Fort Hamilton, as well as Bath Beach, Dyker Heights and Bensonhurst—was 907 in 1810; by 1880, it was 4,742. This (relatively modest) development was transformational. But people still thought fondly of this “Gold Coast” Shore Road. 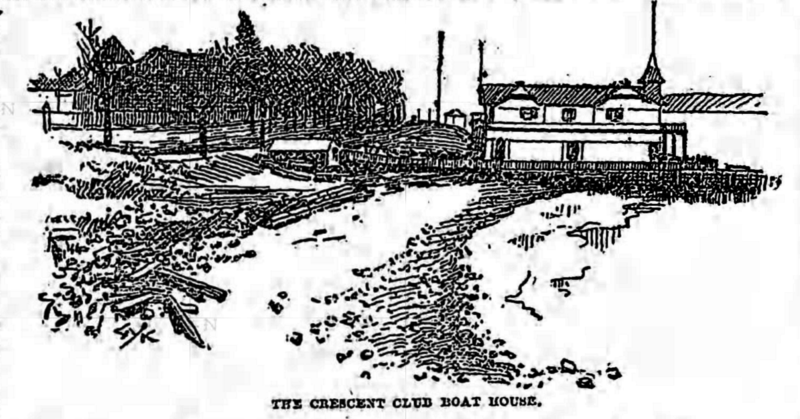 Grace A. Glen, in her 1962 pamphlet Old Bay Ridge, remembers it from the 1880s. The Shore Road was a pretty country road with tall hedges of honey suckle, wild roses and other wild growths on one side which sloped down a steep bank to a narrow belt of pebbly sand. Many people had private Bathing Boxes along the little beaches and in hot summers took full advantage of the cool clear water. Our landlady had two of these Bathing Boxes and once in a while Mother borrowed the key and took us children down for a swim. The other side of the road was lined with comfortable houses with their flower gardens. But to the oldtimers, this Shore Road was a mere imitation of what had so ensorcelled Henry Beecher. 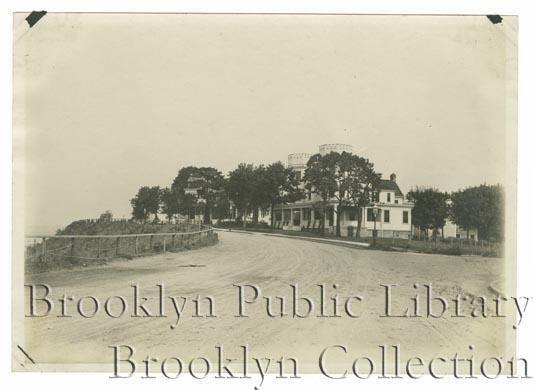 “The old Shore Road…is now largely a memory of the older generation of men,” the Brooklyn Eagle reported in 1894. Many of the old trees along the bluff have been cut away and an unsightly tangle of cat’s briar, woodbine and poison ivy has succeeded the previous forest groves. Trees that still stand, not a few of them, at any rate, have had their lower branches ruthlessly chopped off so that the people living in the cottages above the roadway could gain an unobstructed view of the bay. Off shore, low-lying flats barely covered by the water mar the beauty of the little coves and promontories, and one zealous real estate agent has boldly launched the sign ‘To let for manufacturing purposes,” over a waste of green scum and stagnant water beyond the Crescent Club boathouse [at about what’s now 83rd Street]. The sea is still there and the tides daily strike against the sloping beach, and the blue vista of Staten Island daily looms in the distance. But the beautiful country road and its surroundings are in a sad state of disrepair and without some such work…would be certain of losing still further of its old time attractions. It was believed that the only way to protect Shore Road from further disfigurement was to make it a park, and landscape it accordingly. It may have been a practical solution, but it was also preposterous hubris—the belief that men could improve upon Shore Road, when all they would accomplish was more defacement of its natural beauty. We can never know what it would have felt like 150 years ago to stand at the southwestern edge of Long Island, amid the splendor that was sparkling seas (and verdant hills beyond) on one side, countryside on the other. But we can know, from the rapturous descriptions of its admirers, that it’s not what we have today. You can stand on Shore Road and feel touched, moved, impressed, even awed. But who ever stood outside an apartment building, looked at a highway, and thought, only god could have crafted such wonders? There was a generation or two of men who conspired to replace the divine with the mortal, leaving us to wonder only at our own incapacitated wonder. Local officials wanted to remedy this with a public park, the idea for which was at least as old as the 1860s. “Frederick Law Olmsted, the landscape architect, as he daily crossed from Staten Island to New York, while at work on Central and Prospect parks, looked longingly toward the New Utrecht shore and resolved the possibilities which such a magnificent wooded waterfront afforded,” the Eagle reported in 1894. The great parks designer wasn’t the first or only person to have such an idea, but the imagined park didn’t begin to become a reality until the 1880s and 90s. Former Brooklyn parks commissioner Elijah R. Kennedy spearheaded the project, eventually bringing in Olmsted to consult. 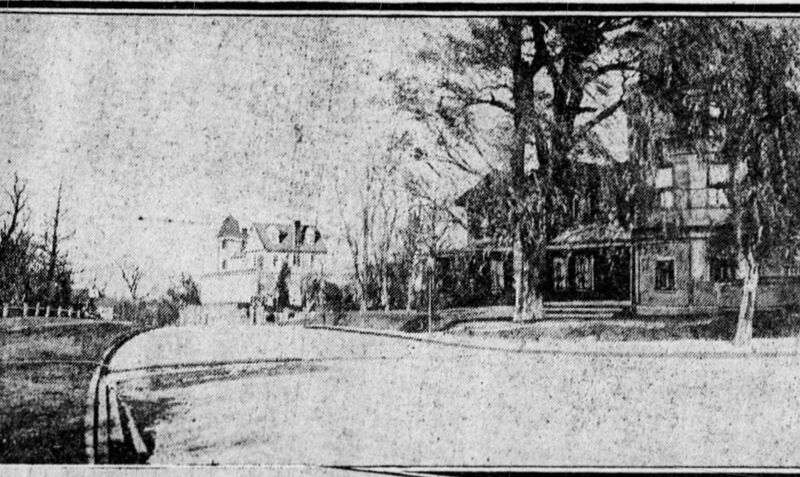 The elder landscaper visited Shore Road in December 1892, with his nephew/adopted son/business parter John Olmsted, “and advised on the width of the road at its northern beginning point,” according to David Schuyler and Gregory Kaliss’s introduction to Volume IX of The Papers of Frederick Law Olmsted. “Olmsted and John visited the site several more times, and on January 16, 1895, a day Olmsted was in the office, the firm submitted a general plan, but no construction would commence until after Olmsted’s death” in 1903. 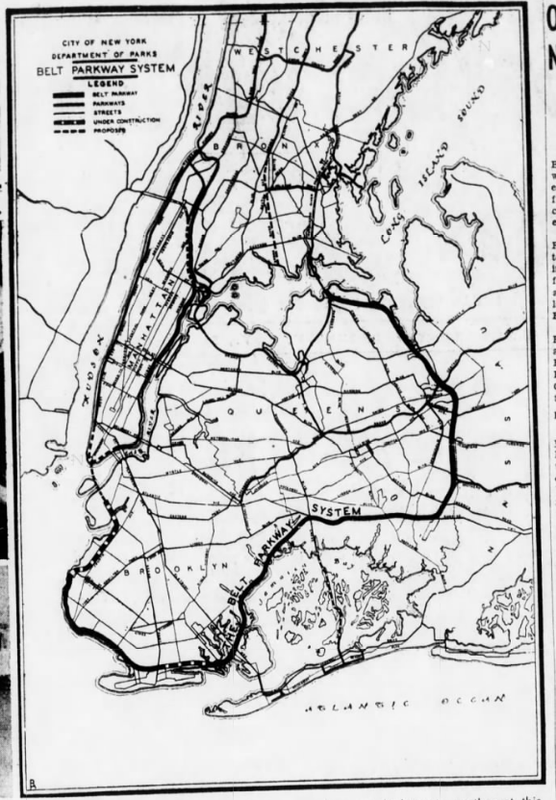 The Olmsted plan, pictured above but also available in extreme close-up on the NYPL website, called for parallel lines of trees to border the Shore Road itself, while a comparatively narrow bicycle path would run along the entire waterfront. 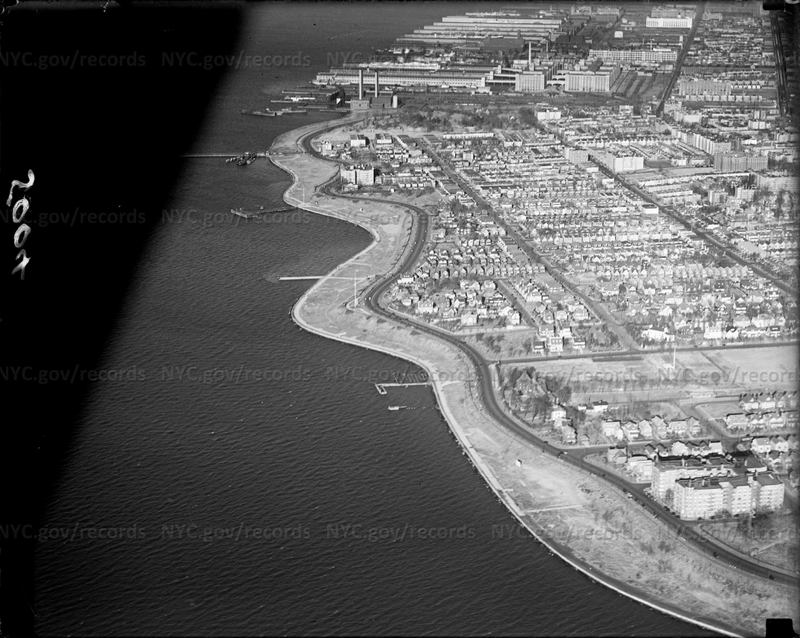 There would be a modest amount of landfilling (compared to what exists at present) between the two, along almost all of the shoreline, to make the park a little wider, especially between Bay Ridge Avenue and 72nd Street, and 91st Street and the armybase. (Compare the proposed park to the existing shoreline by looking close-up at this map.) South of 86th Street, the park would be wide enough for a second road to run down alongside the bike path—a scaled-down version of our modern Belt Parkway. 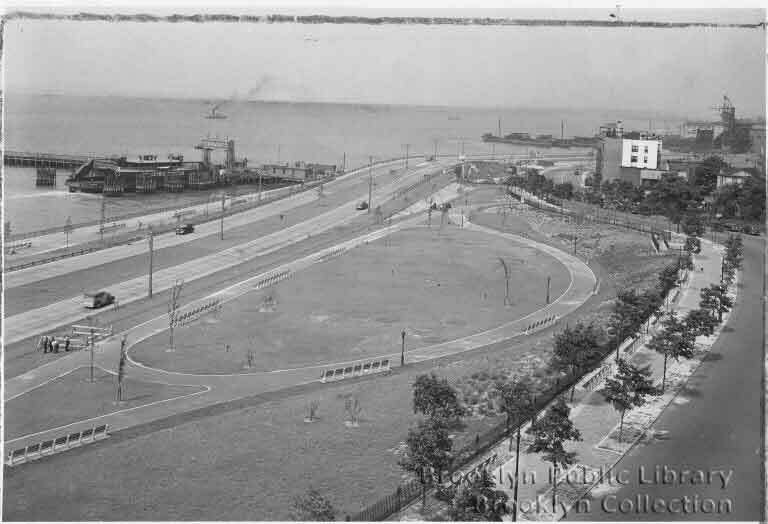 Olmsted planned not only Shore Road but the entire “Bay Ridge Parkway,” a single superpark (not 75th Street) that would have branched off from Fort Hamilton Parkway between 66th and 67th streets, run down to Shore Road and curved south, extending all the way down to Fort Hamilton armybase—with Owl’s Head park and Cannonball Park (then Fort Hamilton Park) along the way. 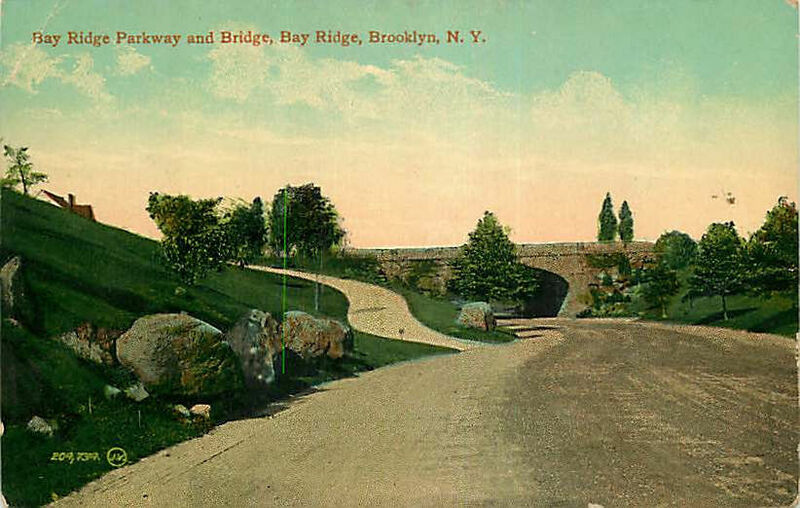 Eventually, “Bay Ridge Parkway” became the name for 67th Street, what we now call Leif Ericson Park, which, before the Belt Parkway, connected with Shore Road at the northwestern edge of Owl’s Head park. Through the center of the new parkway will be a drive forty feet in width and following as nearly as possible the winding of the present road. On either side will be long, turf carpeted avenues of trees, like those seen in the beautiful boulevards of Paris and Berlin in the old world and Cleveland and Detroit in this country. On the bay side of the driveway there will be a spacious promenade, sixteen feet wide, for pedestrians. From this promenade the most noble views of sky, sea and water can be obtained, while only the green sward and the rows of trees will separate foot travelers form the endless procession of turnouts [horse-drawn vehicles] and carriages on the driveway to the left. On the extreme left [east] side of the drive there will be a narrow walk, hardly more than a path, for the convenience of the cottagers and other residents along the line of the parkway. It is not expected that this driveway will be much used by visitors, as it is preferred to make a narrow path of this kind than to seriously encroach on the front lawns of residents. From the edge of the bluff the visitor will look down, below the green hillside, on a second roadway skirting the water’s edge and occasionally uniting with the main higher driveway at the lower elevations of the shore. Such a beach drive, although common at our sea resorts and also very popular in continental cities, is a decidedly novel idea for New Yorkers, and the commissioners think it will prove very popular. The natural line of the present coves and promontories will be carefully preserved, but a large portion of the shallow flats now under water will be filled in with soil to afford room for the drive just spoken of. By this plan the commissioners hope to have sufficient space for the entire parkway and at the same time not to interfere seriously with the pretty little villas which at present occupy the bluff. Most of the forest growth standing today is considered unsuitable for the kind of parkway which Mr. Olmsted has designed. To be sure there are some fine beeches planted toward Fort Hamilton…and these will be preserved, but most of the cedars, which had had no sort of care and are very irregular in appearance, will be removed. On some of the promontories there will be shelters for the accommodation of passengers on hot afternoons or during a sudden rain storm. There will also be suitable retiring rooms for women and children. It is thickly dotted with trees of colonial growth, so that no expense need be incurred in the planting of new growths. This beautiful ocean grove, beneath whose shade there is a supporting mass of shrubbery, includes every known variety of trees that flourish on Long Island or in this latitude. This diversity enhances the value and attractiveness of the spot which nature has enriched so liberally that the city is spared the cost which might otherwise be necessary to create what has already been provided. Even today, there are many more trees at Shore Road’s south end than its north—and more species diversity, too, including what look to me (no tree expert) like beeches, compared to mostly oaks between Fort Hamilton High School and Owl’s Head. 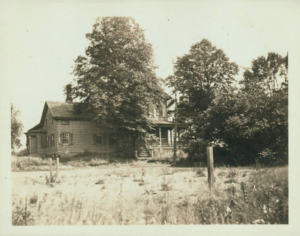 Around 1899, the idea of a subway to Bay Ridge was first proposed, kicking off a speculative real-estate boom that would intensify from the teens to the thirties, when the old farmable acreages were divvied up into thousands of modern-home-sized plots. (At the time, various trains, as well as trolleys and dummy-cars, came to Bay Ridge and Fort Hamilton, but none ran below ground.) 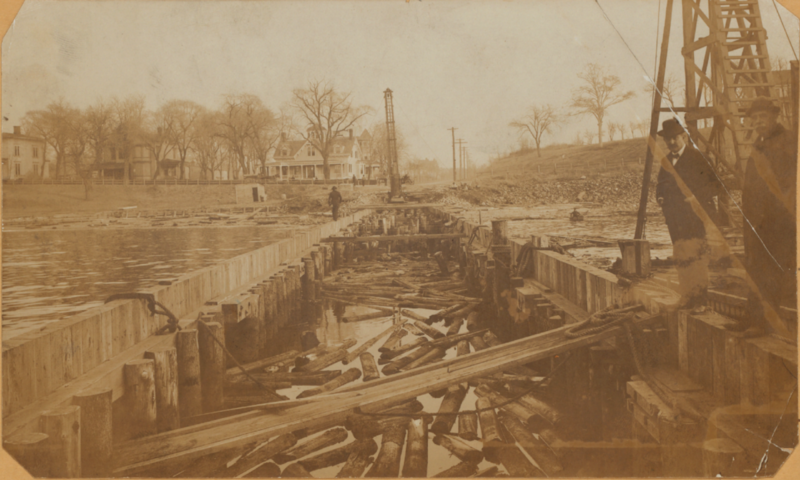 In the late 19th century, Bay Ridge was rapidly approaching a turning point. 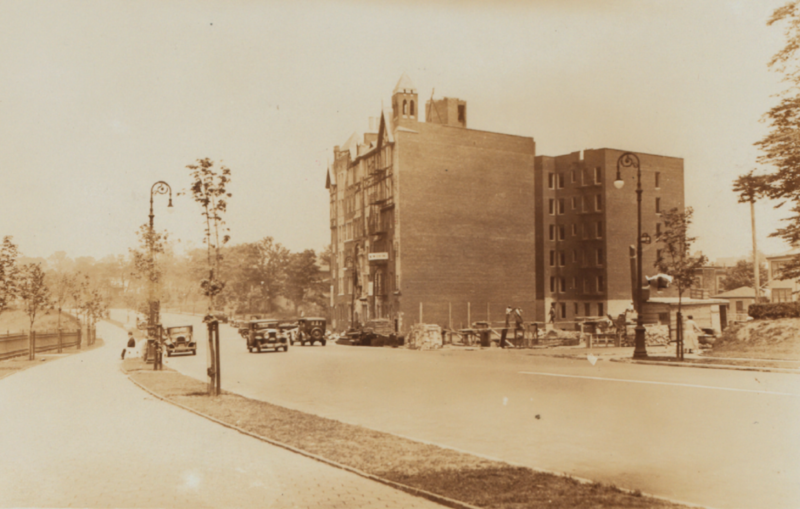 The transformation of Shore Road was a part of this inexorable modernization. It is too late now to speak of what the city might have done twenty, aye, even ten, years ago. It could then, at moderate expense, have taken the entire of this charming district, between Third Avenue, Bay Ridge Avenue and Fort Hamilton, as a public park [as in, all of Bay Ridge, west of Third Avenue]. Now it would be impossible. 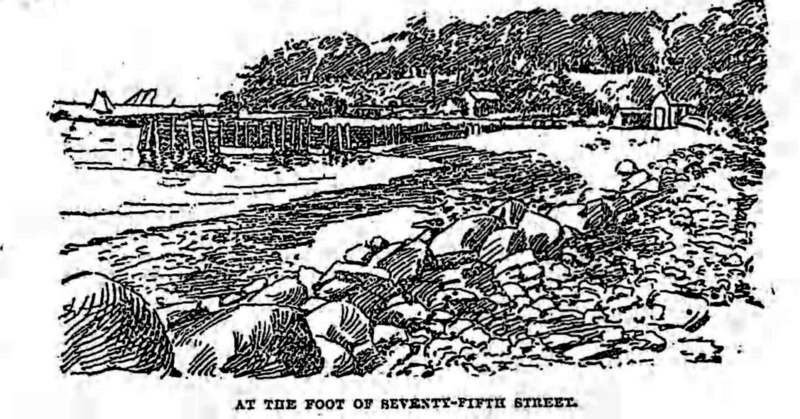 People are awaking to the magnificent panorama the waters of the Narrows present to fortunate dwellers on this lovely road, and lots cannot now be purchased there less than $2,500 apiece [almost $65,000, adjusted for inflation]…It was a chance that the city of Brooklyn will never have again. Now they must buy land for parks that is almost barren and spend fortunes on cranks and their whims in attempting to do what nature had already done on the Shore road. So much for the road in the past and in the future. If there were any attempt to widen the road, to the extend of 150 feet, I think there would be serious opposition. The sentiment is that a uniform widening of the road to make it sixty or even seventy feet wide would meet with their entire approval…the assessed valuation of property along the road is about $1,00,000 [almost $26 million, adjusted for inflation], but the actual value to property owners is much more. We have planted these fine trees which add so much to the beauty of our homes; we have cultivated these lands for generations, and we are all proud of the locality as one of the beauty spots of suburban Brooklyn, and we are ready to meet in entire friendliness anyone who comes to help us to add to its beauty. The commission has been importuned to assist people keeping so called public houses in retaining their liquor licenses. But we have decided to oppose all such licenses and to get possession of all buildings that must be removed…it is our intention to clear away all shanties, bathhouses, sheds and public houses. On the eastern boundary we shall make a sidewalk only six feet wide. Of course the public will desire to walk on the west or water side and this sidewalk will be merely for the accommodation of the residents along the road. We shall establish a grassy stretch eight feet wide next to the sidewalk above alluded to, extending over the entire road. Along this grassy stretch will be an avenue of shade trees. What tree should be planted has caused a good deal of thought to the commission and to the designers of this work. The road being so near the salt water and exposed to the westerly winds makes it difficult for isolated shade trees to grow. Only a few varieties will thrive. The whole length of the island shore, and I am familiar with nearly every foot of its length, shows that the oak thrives from Fort Hamilton to Montauk Point. One of the chief improvements that have already taken place…is the filling in of the Old Lane dock at the foot of Ninety-sixth street. For years this dock has been slowly becoming covered with salt mud and the odor from it has made riding near it very unpleasant. The work of filling the dock in with clay has just been completed and now, instead of the unsightly, bad smelling ruin there is a plot of land about 600 feet square, jutting out into the water that gives a splendid field for the work of Messrs. Olmsted, Olmsted & Eliot, the landscape gardeners in charge of that branch of work along the driveway. The work remaining included the first of the two roadways, the one farthest from the water. The building of this road is to be no slight task. First the entire ground will have to be graded and then gone over several times with a fifteen ton roller. Then the entire width of the driveway will be laid with Telford blocks [like Belgian blocks], cut by hand out of Trap rock. Then these stones are wedged in with chips of rock. Dirt is then put over, and the whole rolled again. Finally the macadam is laid upon this foundation. Just the one road was expected to take the entire summer. 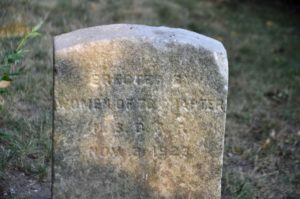 For the time being, Brower would move some roads to preserve the natural bluffs and leave some trees and shrubbery in place, rather than cut down and replace them, he said. 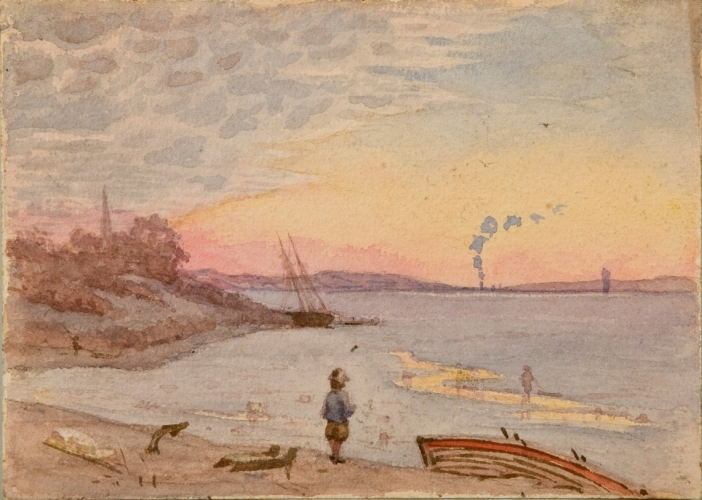 He would still build a park and esplanade at the southern end of Shore Road, though not the proposed electric fountains and flower gardens—“two things, by the way, which experience has taught us cannot exist anywhere near each other”—because of the money required not only to build but to maintain them. 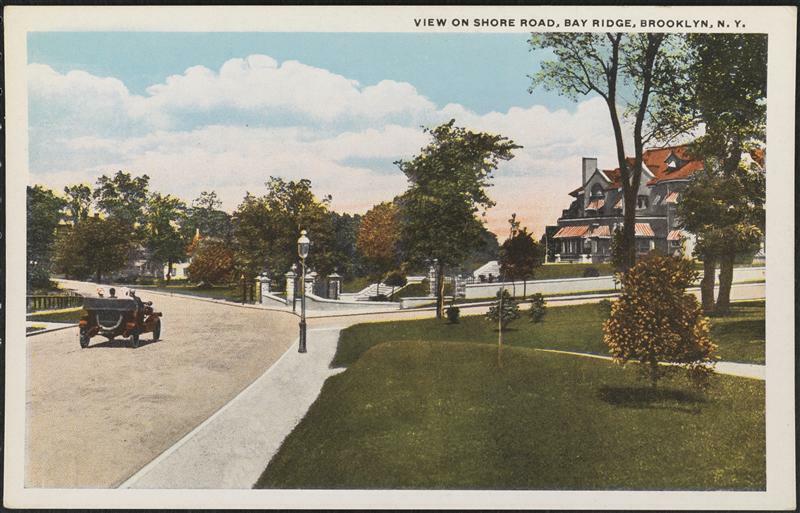 Though averring a professional allegiance to realizing the plans he’d been given to the best of his ability, Brower also criticized them personally, especially for the drive leading to Shore Road from Fort Hamilton Avenue—the “Bay Ridge Parkway,” running down 67th Street (today, Leif Ericson Park). I believe that the property along Sixty-seventh street, a whole block of which is now owned by the city, should not have been bought. It meant the expenditure of $2,000,000 [more than $56 million adjusted for inflation] at least to build a viaduct or to fill in. That two million should not have been spent on the tail end of the driveway, but could have been well used further on. It is all very well to have an imposing entrance to the driveway. 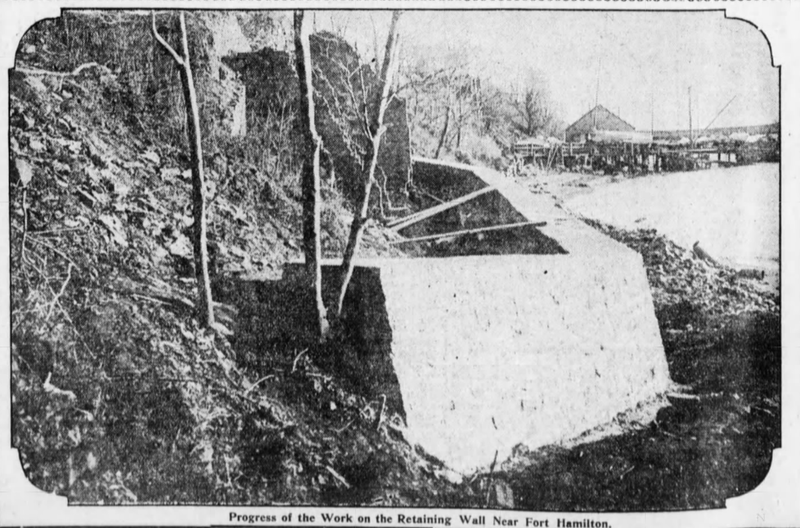 The entrance could have been better designed, however, had it not entailed the construction of a roadway under such expensive circumstances as are brought about by the declivity reaching from the shore road to Fort Hamilton avenue. He also wasn’t thrilled with the Olmsted et al. plans for Shore Road, in words that reach across history to my own heart. I believe the commissioners wandered too far away from nature and destroyed the picturesqueness of the road by making it too artificial and gingerbread looking. But that is neither here nor there now. What I wish to do is to give the present generation some use of this road and the beautiful parks we will have along the shore. By 1900, when at least one writer declared Shore Road “now completed,” it had changed significantly from the road Beecher had once gazed upon. But it was still celebrated for its beauty. 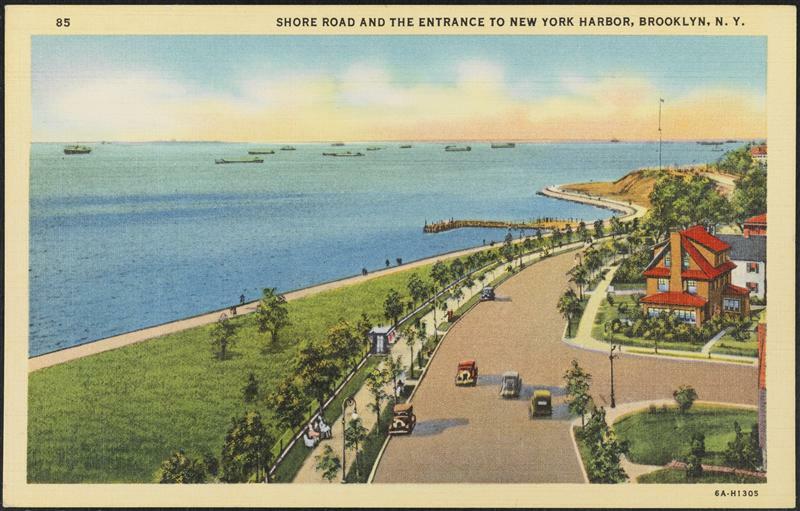 Those…who delight in nothing so much as a divided life between land and sea…find the climax of their wishes in the zone or strip of land that skirts Brooklyn’s great marine avenue, the Shore drive. From this vantage ground of superior observation the shore side dweller may almost violate physical laws and be in two places and enjoying two conditions of existence at the same time. …No other known locality given up to fashionable residences offers such a shifting scene vested with an interest that never ceases or fades. One might go a thousand miles from New York and only duplicate the most unimportant fraction of this perennial picture thrown upon a brilliant background of sea and sky, with contrasting lights and shades added by the fleeting clouds and solar rays. Nature and the city authorities have joined hands in a united effort to make the Shore drive, hemmed in by opposing stretches of surf and shade, a parkway in keeping with its double environment, from which, on the other hand, the sun makes the waves blossom with iridescent colors, in harmonious contrast with the rich bank of flowers and shrubbery which rises above the promenade on the land side of the ocean thoroughfare. It is quite superfluous to observe that residential conditions so inviting have not gone unappreciated. Real estate is not an insignificant part of the Shore Road story. The wealthiest families of the area had always built their homes by the shore—first, farmhouses and homesteads (with slaves), but by the turn of the 20th century, Gilded Age industrialists had arrived to built their mansions here. Niels Paulson, head of a major ironworks, built in 1890 his all-copper house at the corner of 88th Street; the house belonging to cork manufacturer John Robinson—surrounded by flowers, between 93rd and 94th streets—was good enough in 1904 for turn-of-the-century stage star Lillian Russell; and armaments manufacturer E.W. Bliss in the 1880s had refurbished State Senator Henry Murphy’s impressive mansion—and built a storybook observation tower, like a European ruin—atop the hill that later became Owl’s Head Park, at the northern end of Shore Road. There were dozens of similarly impressive homes in between. 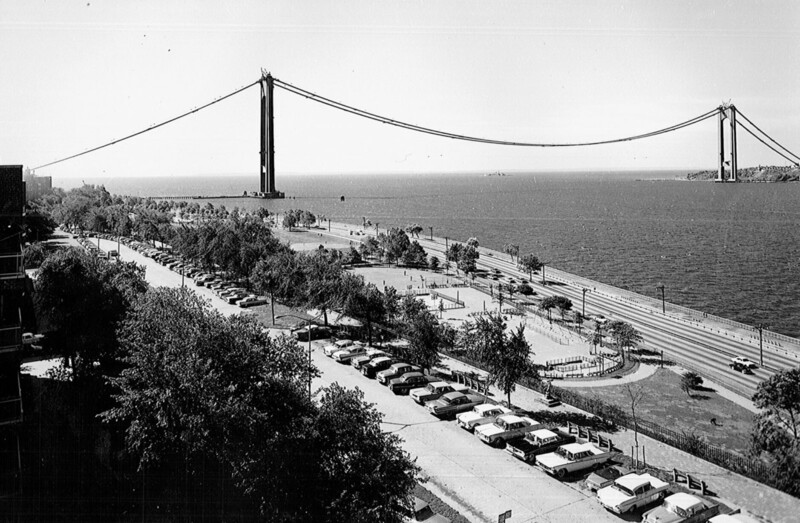 “The $12,000,000 expended by the city of Brooklyn in the Shore Drive and other kindred improvements have born fruit in the rise of 100 percent in the assessed values of Thirtieth Ward properties,” the Eagle reported. In 1898, 455 houses were built in the Thirtieth Ward, which encompassed Bay Ridge to Bensonhurst; in 1899, there were another 456. Still, even those who profited from this transformation weren’t thrilled about it, according to the Eagle. 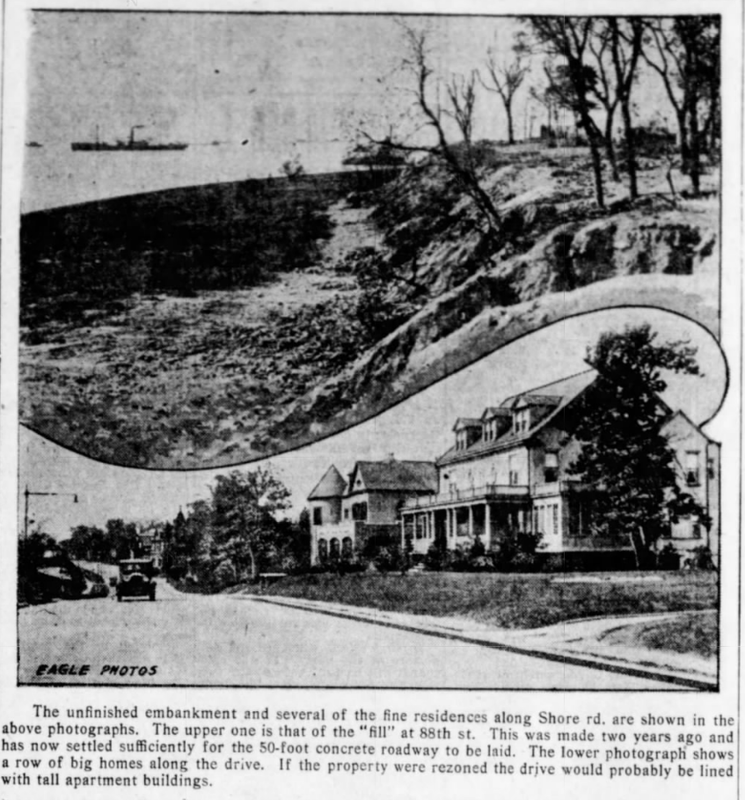 Incredible…is the uncompromising opposition of the old time Bay Ridge land owners of colonial extraction to the the construction of the Shore Drive. These denizens of the maritime district…who have been made rich by the conversion of ploughed fields into city lots of high value, could not reconcile their minds to the new state of things which was for them a veritable golden age, in the literal and not the figurative sense of the term. Nowadays London, Paris and Naples are visited by the descendants of old farmers and gardeners to whom the old time New York, which only covered a part of Manhattan Island, was the ultima thule of travel. This harvest of wealth, garnered from acres which formerly produced only garden truck, enables the beneficiaries by time’s revolution of evolution to be clothed in the finest raiment, instead of the coarse domestic fabrics of the olden time. It is the old story of the fallibility of the human ken and the proneness of men to stand in their own light. But fate and destiny are inexorable and compel opposers of progress to be kind to themselves against their will and receive the benefits which they cannot reject. At the start of the 20th century, Shore Road had some problems. Unauthorized bathhouses were built on parkland. 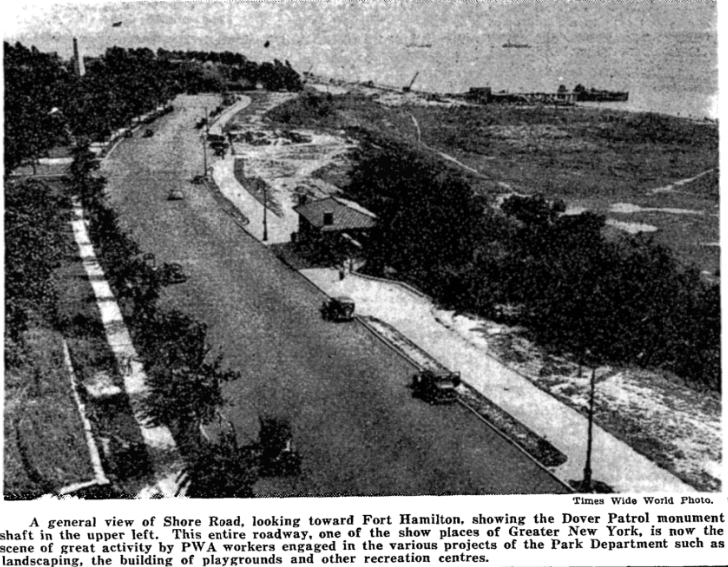 Without a proper sewer system, businesses in the Fort Hamilton village resort-town were using surface pipes to transfer sewage (including stale beer) to parkland, creating literal cesspools and causing an awful stink. Residents complained authorities failed to sprinkle the road with water and thus Shore Road could become disagreeably dusty. They also didn’t like that men, women and children promenaded down the exclusive street in their wet bathing suits. Sections of cheaply and closely built cottages alternate with areas in which one’s eyes rest upon pleasing architectural effects, velvety laws and well-kept shrubbery…The strange thing is that the cheaply built sections show no obvious inferiority in situation to those which are well built. Every property owner is apparently permitted to take the shortest cut to making his land remunerative, and I presume that the owner of a lot on the Shore Road could, if he thought it in the interest of his pocketbook, put up a cheap hotel, regardless of the interests of his neighbors. There seems to be something wrong in this, for I am enough of a socialist to believe that a man should not be allowed to do what he likes with his own where in so doing his interests conflict with a large community. 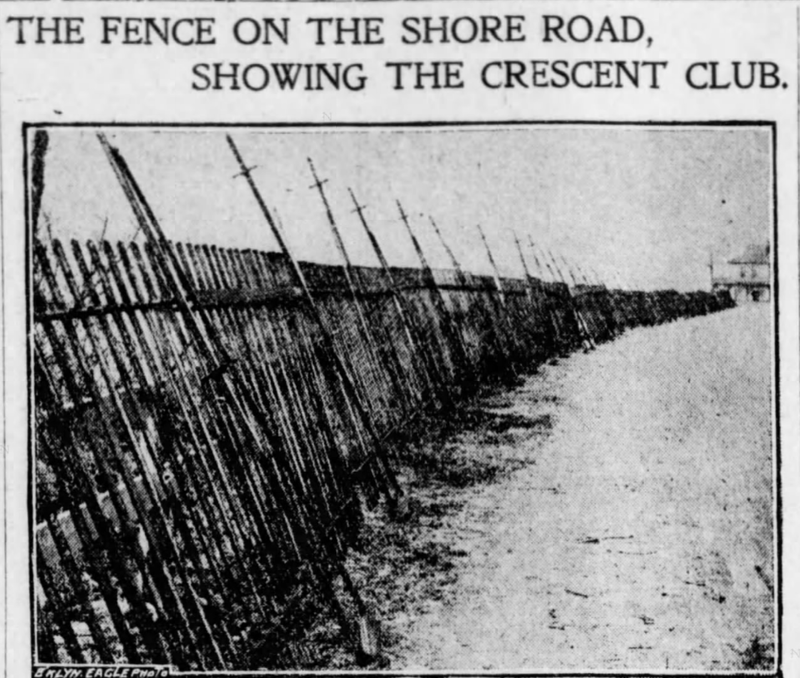 The Shore Road…is now ornamented on the water side with prone sections of a very tall iron picket fence, the austere simplicity of which is relieved by a coating of bright red rust. 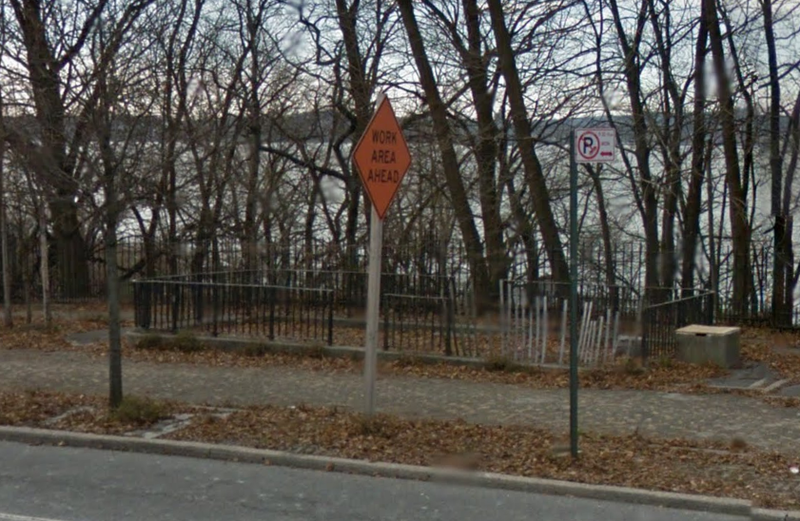 If the plans of our park commissioner for embellishing one of the few drives in this borough which for some inexplicable reason has been permitted to retain its charm are carried out, pedestrians or wheelmen who seek the Shore Road for the sake of the water view will have become cross-eyed before they have traveled its entire length. 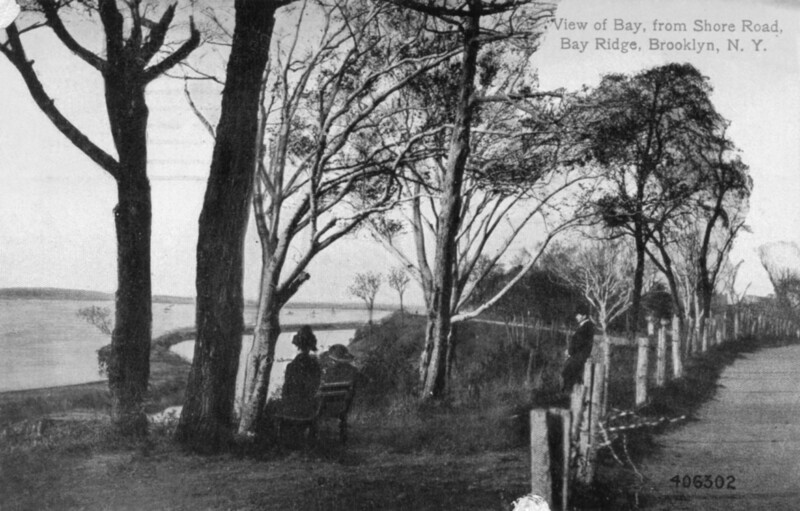 The suggested compromise, here and elsewhere, was a three- or four-foot rail fence, allowing most adults an unobstructed view of the bay and beyond while protecting drivers, which is why the parks commissioner said it was necessary. It is dangerous to take a drive there, as was proven a few weeks ago, when former Mayor [Frederick] Wurster narrowly escaped serious injury in a runaway accident on the Shore road. The banks are extremely precipitous, almost perpendicular in places, and unless there is some barrier a serious calamity will take place there some day. The commissioner also said the fence would improve the appearance of the “unattractive” driveway. Indeed, a letter writer in 1903 complained to the Eagle that Olmsted’s plans had been ignored for lack of funds. “Beside the expenditure of a small a balance remaining on hand after the purchase of the necessary land by the city…which was used to put down what was looked upon at the time as a temporary road, practically nothing has been done to develop this priceless asset of the city,” a local wrote. Work on the fence stopped when the local citizens association protested, but then the thing the commissioner feared actually happened. While two women, guests of a local colonel, were driven along Fort Hamilton Parkway (then, “Avenue”), the horses were frightened at the corner of 92nd Street and darted down the street. The driver dropped a rein; one of the women picked it up, and they pulled together. The team sped past the colonel’s quarters and he, accompanied by several officers who were on the piazza, saw the horses. They realized at once that something was wrong and followed the team. At the corner of the Shore road and Fort Hamilton avenue, Policeman Riley jumped out into the roadway and grabbed the horse nearest to him by the bridle. He was thrown to the ground, however, and the team continued toward the edge of the bluff. 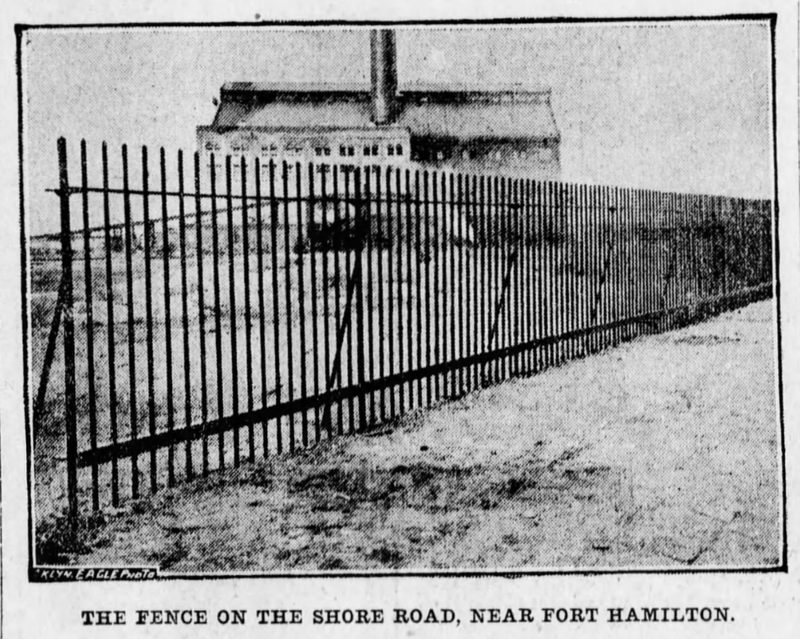 The old fence that has stood at the foot of Fort Hamilton avenue for years was carried away as though it had been of paper and it looked almost certain that the occupants would be carried to instant death on the rocky beach below. Several feet from the top of the bluff, however, stands an old oak tree and the surrey and horses became entangled in it. There was a horse on either side of the tree and both were trying their best to get free. Finally one of them did and rolled to the bottom of the fifty foot embankment. The two young women managed to keep their seats in the surrey but were somewhat shaken up and bruised. [The driver] had a thumb broken in the accident. It is a mistake to suppose Shore road was to be merely a driveway. The plans already approved and on file in the Park Department show that it has every element of a people’s park, the driveway being but one feature of it…The city owns the land on the water side of the Shore road. 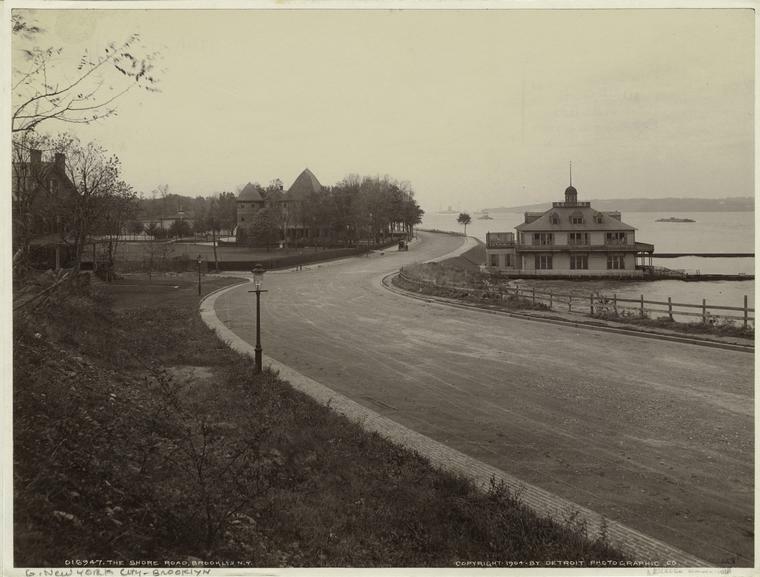 The plans of Mr. Olmsted never contemplated that the Shore road was to remain but 14 wide in places, but did contemplate the filling in of this strip of land under water owned by the city, so that there would be a narrow park of four miles in length, with esplanades, driveways and beautiful trees and shrubbery, making it the most beautiful park in the world, and for the use of the people who have no fast horses, as well as those who do have them. Small merchants, dealing in all kinds of commodities, have established themselves at frequent points on Third avenue. Construction companies and real estate offices are prominent also. The raw sides of many a new or unfinished block of houses—in any direction one looks—certifies to the activity in these latter lines…It may seem inconsistent with facts that, with the painful congestion of population in lower Manhattan and within a mile of Borough Hall, Brooklyn, during the past decade or so, such a section as [Bay Ridge], within a few miles of these great centers of business, should have escaped development. But the fact is nevertheless true. During these years when hundreds of thousands of people have been looking for homesteads accessible to business offices, this territory was growing corn and pasturing cows. The old proverb that “the first shall be last” seems to have some indication of fulfillment in this connection. The developing Shore Road park was one more amenity to draw new residents here, to make bundles of money for the real estate men and the lucky owners of farms and estates. 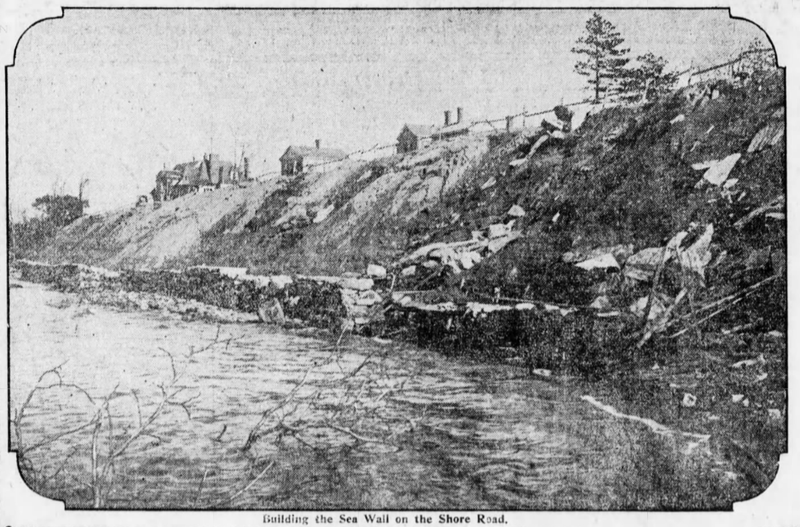 In June 1905, retaining walls and sea walls were built along the shaggy cliffs, which had begun to cave in and become “rough and out of harmony with the beauty of the landscape,” the Eagle reported. They were to be fixed up, graded, planted with flowers and cut in places with staircases, to allow easy access to the shore. After macadamizing was finished in 1906, landfill was the next big step. The city had been sure to acquire the rights to the land underwater beside the parkway in the 1890s, all the way out to the pier-line, to “forever prevent the marring or despoiling of the property by manufacturing or commercial interests, with the recommendation that the land under water be reclaimed for the purpose of giving width to the parkway, as it was estimated that it would be cheaper to fill in the land under water than to take additional land to the east,” the Eagle reported. 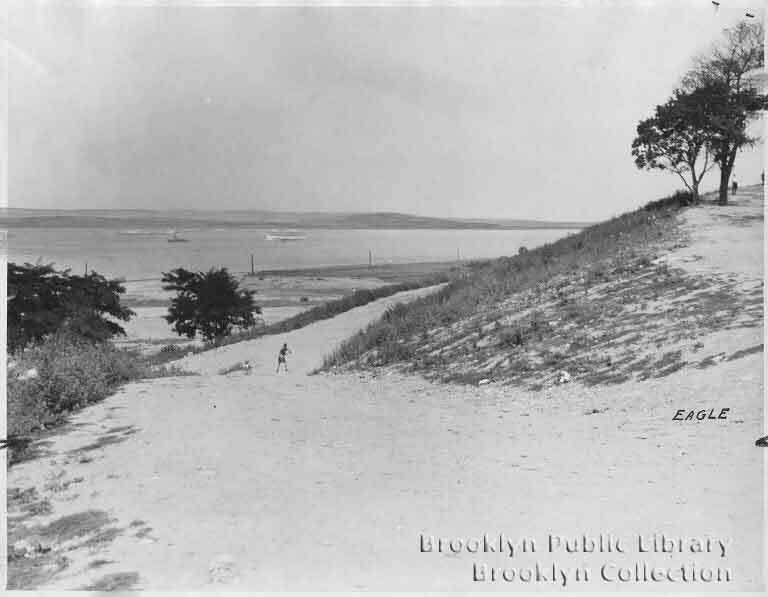 The landfill would be needed to construct Olmsted’s double drive, like the Shore Road/Belt Parkway we have today—one along the outermost shore, the other along the bluffs. In 1905, the Board of Estimate (a precursor to our city council) had appropriated $1.875 million [approximately $48 million, adjusted for inflation] for the project, though $1 million was soon cut from that. By 1907, the estimated cost had increased to a whopping $5 million [almost $125 million, adjusted for inflation], but the project at least was progressing. 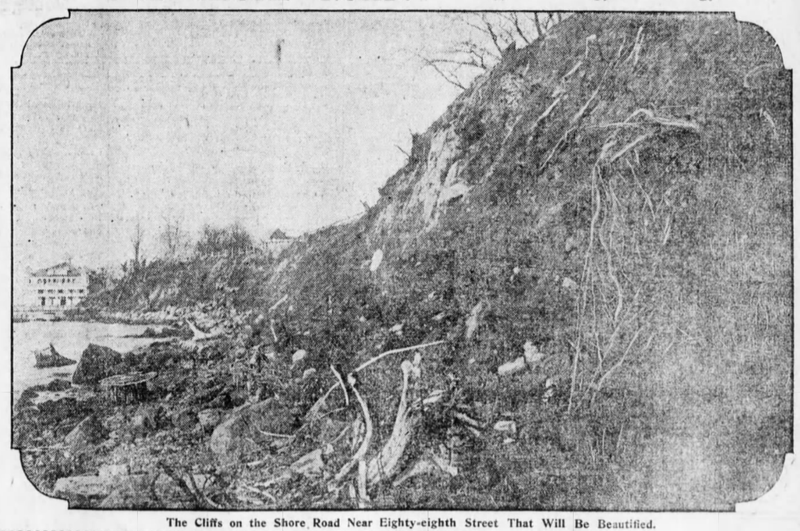 Work had begun at 95th Street and was expected to reach the armybase by December 1907 (though it still hadn’t by March 1908), then return to 95th Street to head north, the Eagle reported. It was hoped all the work would be finished by 1913. [The drive along the water] will be protected by a seawall, the superstructure of which will be granite. It is the foundation of this roadway that the contractors are now engaged upon…Over 10,000 tons of rip-rap stone has already been sunk Nearly one hundred piles, for the foundation, at intervals of about fifty feet, have been driven. Between the two driveways “will be a stretch of land varying in width from 200 to 800 feet. It is to be the beautification of this land that the Park Department will particularly apply itself to. 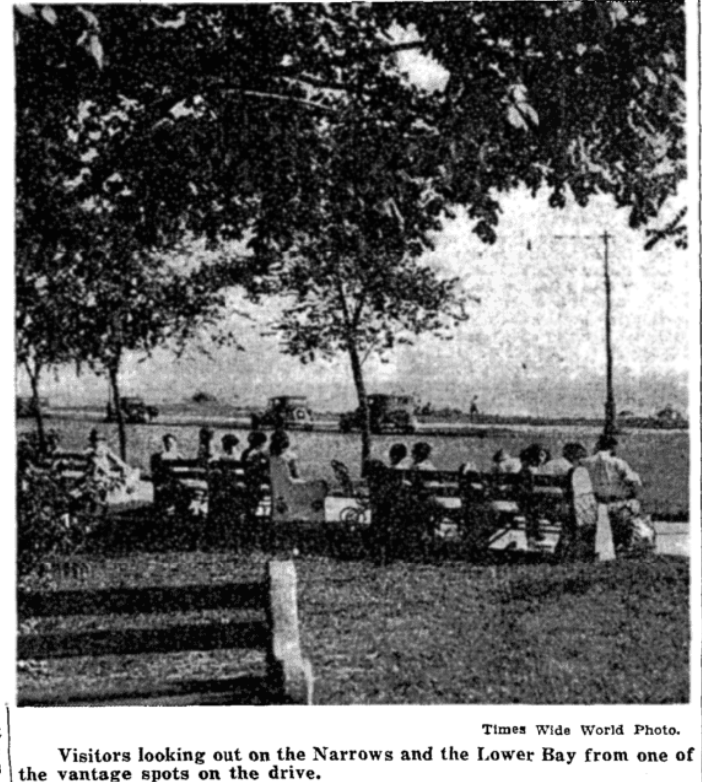 Paths and promenades, as well as cycle paths, will be constructed.” This is the Shore Road park we know today, most of which is landfill—that is, it’s manmade, not natural. 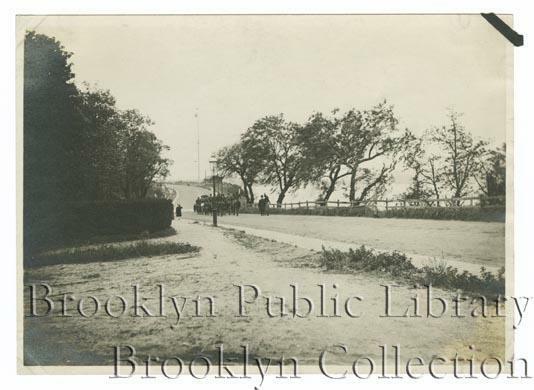 At the end of the 19th century, someone standing on the edge of Shore Road at 80th Street, looking north, would have gazed upon a watery cove; a few decades later, they’d be looking at dry land, basketball courts and baseball diamonds, the sea off in the distance. Work progressed slowly from here. 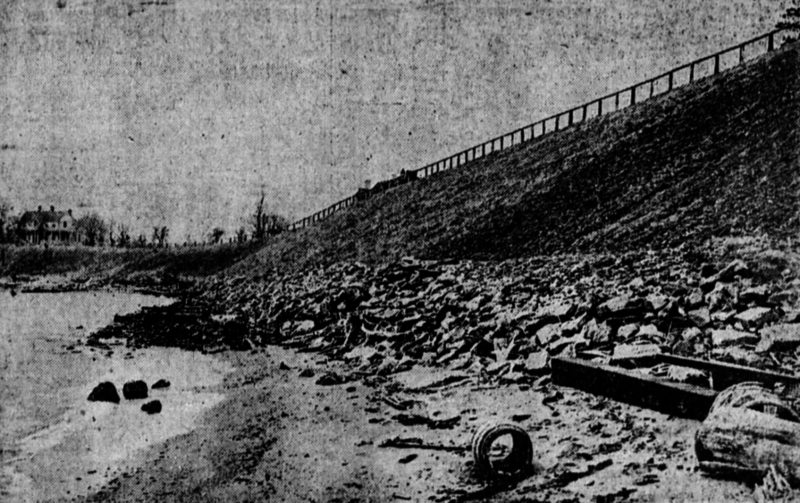 In 1912, the seawall was growing but still unfinished, and the landfilling had not yet begun. (The landfill would come from construction of the Fourth Avenue subway—today’s R train—which began in 1909 and would mostly finish in 1916, though more could have been used that instead went to Governor’s and Roosevelt islands.) Once the landfill had been dumped, officials would need to wait a year for it to settle, before constructing the road. The wall was expected to be finished toward the end of 1914, and some landfilling had begun by May. The project was enormous, requiring 2,000,000 cubic yards of filling for 61 acres of newly created land, requiring 12 miles of sewers and drains, the Eagle reported. 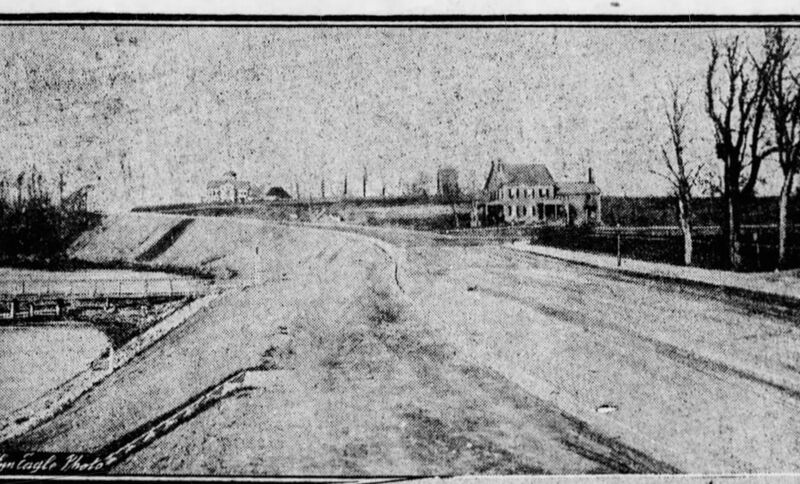 “We have always regarded [the double roadway plan] as an unwarrantable extravagance,” Brooklyn Life reported in May 1914. 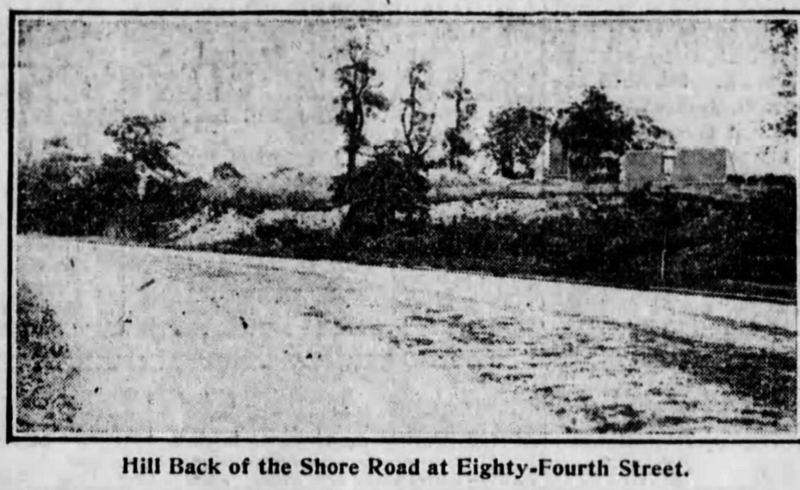 But the magazine changed its mind once plans emerged to connect this Shore Road system to other roadways, such as Warehouse Avenue in Bath Beach (now Shore Parkway), which could link to Kings Highway via Bay Parkway and Avenue P, creating a “continuous circumferential boulevard,” made it seem more economical—not an “isolated local improvement, very beautiful no doubt,” but “one of the finest and longest driveways in the world. The entire city will rejoice in it.” The plan for what would become the Belt Parkway was just starting to come together. Since the beach is good and the hill extending up to Shore road is covered with shade trees, this stretch of waterfront is now used by the children as a playground. The residents are incensed over the condition of the beach, and consider the presence of the dead animals a menace to the health of all who go there. The conditions are considered especially dangerous to the children who gather in large numbers to play on that part of the beach. The bodies of seven dogs were counted yesterday lying high up on the beach. In addition to the seven dogs there were the bodies of a cat, two rats and a couple of chickens. “If we had this thoroughfare in Germany, facing the gateway of the metropolis, it would be crowded all the time with sightseeing vehicles and the millionaires of the city would have their homes along the driveway,” he said. Not just dead pets and rodents. 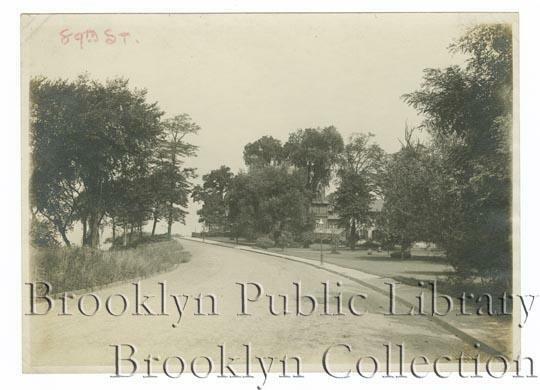 All the progress that had been made improving Shore Road to create parks and driveways stopped dead in 1918. 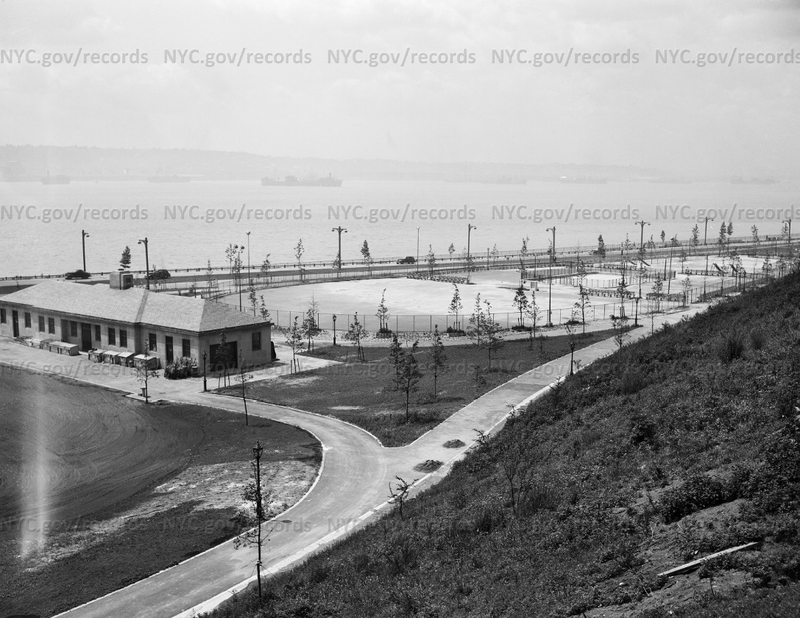 In July that year, the Navy began work on a naval base atop the landfill from 69th to 86th streets, building, in what would become Shore Road park, 99 buildings on 32.5 acres of land, including 38 barracks (plus another two for quarantine), two barber shops, six latrines, a post office, a laundry, a laboratory and many other offices and administrative and maintenance buildings; it would eventually grow to 175 buildings. 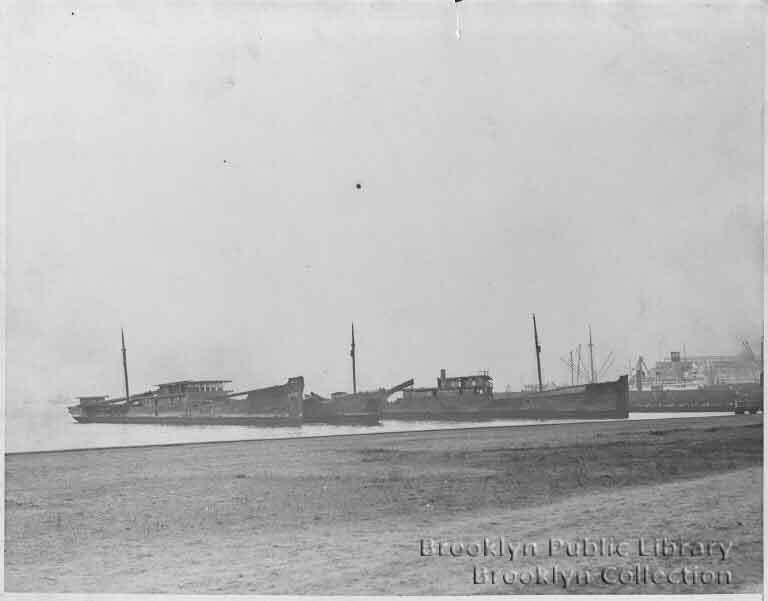 The U.S. had joined WWI the year before, and a receiving ship had been stationed at the foot of 74th Street; the barracks base was meant to accommodate it as it shipped out men or welcomed them home. 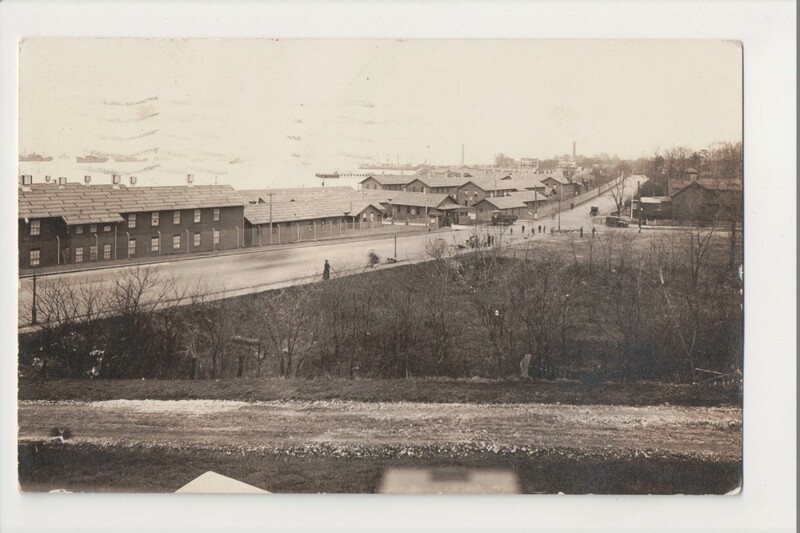 The base was meant to be temporary, but after armistice was declared in November 1918, local leaders were dismayed that the barracks persisted; once up, the Navy wasn’t in a rush to tear them down, especially because the demobilization process was extensive. But then they ran the risk of becoming permanent. The city was angry, because it had already invested millions of dollars in the park, and locals were incensed, not only at the loss of the ambitious project but also, for those along Shore Road, at the damage to property values. An intense battle ensued between navymen who wanted the base to remain and local leaders who wanted it gone, a battle Bay Ridge almost lost. But the sailors finally left, on June 5, 1921. Parks officials had all manner of big plans to use some of the buildings left behind—sell some for lumber, move and turn others into schools, move others to other parks, while using still others as recreational facilities. But these ambitious ideas didn’t pan out, and the parks commissioner had to be ordered by a commission in 1922 to clear the buildings and restore the drive to its prewar condition. It is a pity, indeed, that such indifference is shown by the authorities. Any other community, with so picturesque a driveway, would lose no time in enhancing its beauty with flowerbeds, walks, fountains, etc. Instead, we find it poorly paved, no sidewalks in some parts of it, and an unsightly wire fence running its entire length. Alternate ideas were pitched: one was to turn what became the ballfields at 96th Street into a polo ground, using the steep hill as a natural spot for onlookers. Ironically, during this period of neglect, Shore Road came to define the bourgeoning neighborhood. The SHore Road 5 and SHore Road 8 telephone exchanges—which survive in the present in local landline numbers that begin with 745 or 748—came into use in the 1920s. 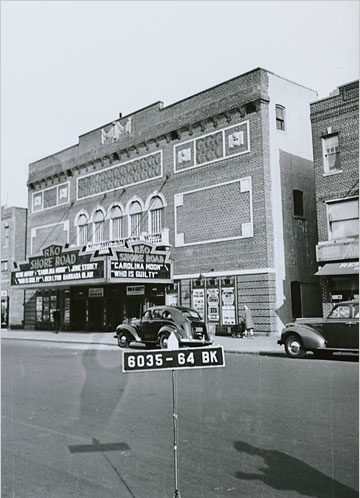 The Shore Road Theater opened in the 1920s on 86th Street, three quarters of a mile from the actual Shore Road. (The building later housed the Nobody Beats the Wiz and is now a Payless, among other things.) Shore Road Garden, a Chinese food restaurant, opened next door. And yet the real Shore Road languished. The wealthy who’d been attracted to the area when it was remote countryside lost interest as it developed into a bustling urban neighborhood; more land was available out east on the Island, especially now that improved transportation, including the advent of the automobile, made travel easier. The barracks period surely didn’t help keep them interested. Even the Crescent Club decamped, for Huntington, in 1931. 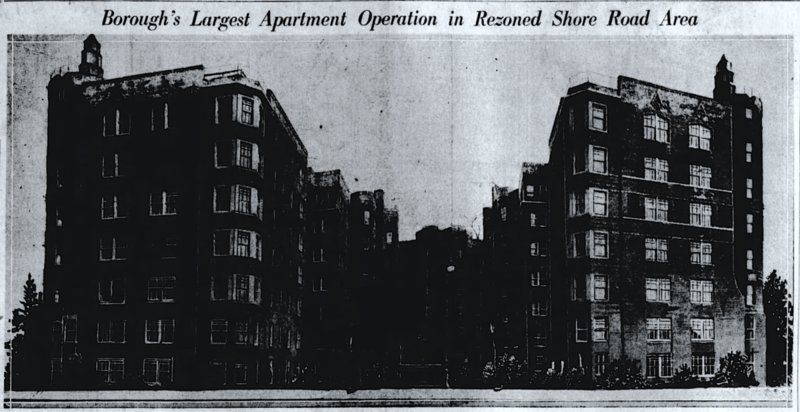 The idea of building apartment buildings on Shore Road is at least as old as 1909, back when work on the sea wall was still plugging along. A Manhattan realtor considered buying property somewhere in the 90s. “I find it a most suitable location for the erection of modern apartment houses,” he said. “Owing to the salt water proximity, the Shore Road location is cooler in summer and warmer in winter than any other part of the city…and affords the most healthful and enjoyable living conditions.” But this proposal must have seemed garish to most back then. [One opponent] maintained that he could visualize the erection of apartments of from 12 to 40 stories which would shut off the air from persons living in houses to the rear. The opposition admitted that small apartment houses on Shore rd. would not be paying investments, but that the apartments probably would be about 10 or 12 stories, to rent for from $35 to $45 a room [roughly $500–$650, adjusted for inflation]. The great ships to and from the seven seas steam through the bay in the daytime forming a colorful picture and at night a moving mass of electric scintillation across the water. The poetry of motion is ever present. Shore Road in the era of its estate ownership was famous for its cool breezes from the lower bay in Summer, rich with the tang of the sea. Within a few years, as Shore Road becomes more completely lined with apartment houses, thousands of residents will have the breath of the sea. For the weary businessman returning to his home on lower Shore Road in the evening it is like spending each night at sea. The deleterious air of the great business centers is far removed. And yet the subway is accessible to annihilate time of travel. 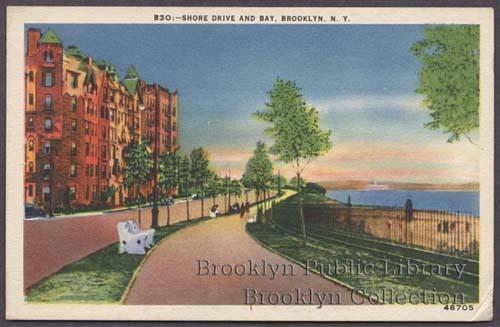 …Shore Road will henceforth be Brooklyn’s finest apartment house district. 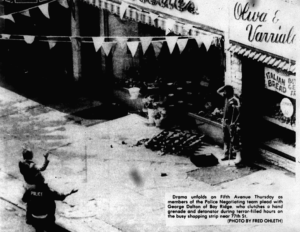 The Eagle published in September 1932 a long interview with Mrs. Otto Heinigke, whose father, James Weir, had suggested the name “Bay Ridge” for the area, and whose father-in-law, Otto Heinigke, Sr., was one of the original artisans who settled in Ovington Village. (Her husband painted the beach scene near the top of this post.) 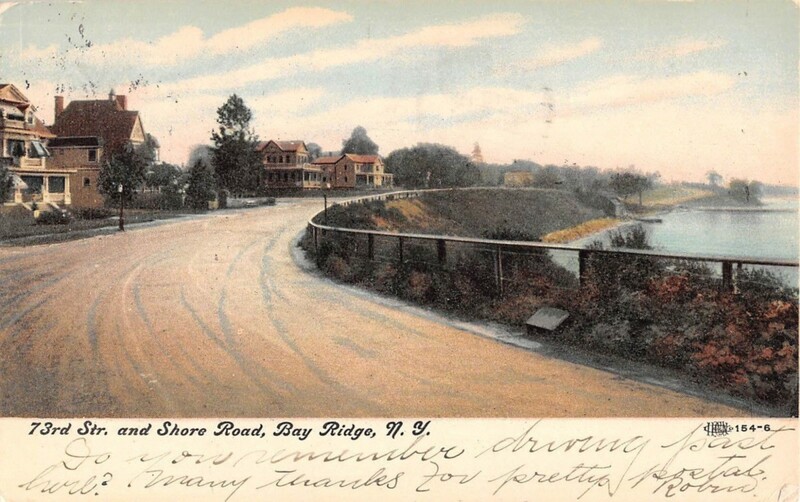 It touched on several subjects regarding old Bay Ridge, including Shore Road. The charm of old Shore Road that combined the countryside with seashore is a happy reminiscence of Mrs. Heinigke…As long as the original owners and their families were in the old homesteads on Shore Road, the beauty of the spot was maintained, said Mrs. Heinigke. “Bay Ridge, so near the city, remained country-like for a long time, but the need of apartment houses has finally encroached upon us,” said Mrs. Heinigke, with a note of regret in her tone. Two things happened in the early/mid 1930s that enabled the Shore Road park project, begun so many decades ago, to be completed. One was the implementation of the Works Progress Administration, a New Deal program that put people to work on public works projects (and its predecessor, the Federal Emergency Relief Administration, and FERA’s Civil Works Administration program); the other was the ascension of Robert Moses to city parks commissioner—a post he would retain until 1960. Moses’s plans seemed inspired in part by the old Olmsted ones, retaining for example the dual-roadway structure, though also much altered to fit his own parks-philosophy. 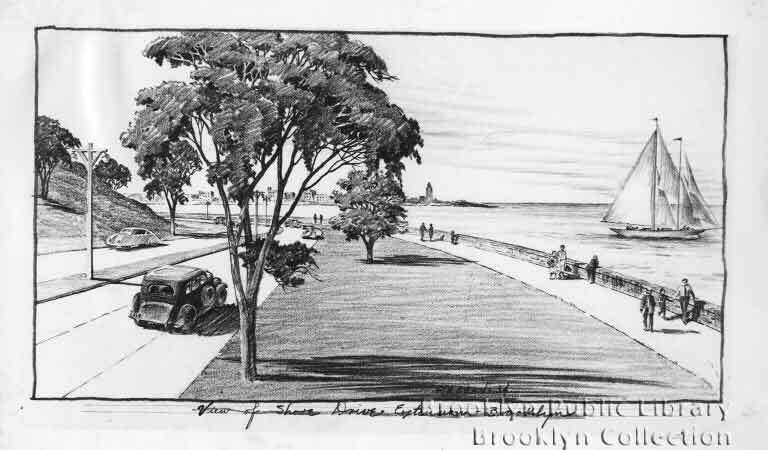 “Robert Moses [was] part of a New Deal generation of reformers with deep skepticism about Romantic park designers such as Frederick Law Olmsted,” Suleiman Osman writes in The Invention of Brownstone Brooklyn. With roots in the Progressive playground movement…city officials [such as Moses] believed that parks were not refuges for solitary elites to meander leisurely but malleable public space with tennis courts, baseball diamonds, skating rinks, zoos, and swimming pools to be constructively by ‘the people.’ Rather than fostering spontaneous self-expression and self-discovery, playgrounds encouraged cooperation and forged communities through structured play. Instead of ‘hidden gems,’ Robert Moses’ parks were modern, integrated, and multiuse segments of a park system connected by transportation arteries. The Times ran a Sunday feature (on the front page of Section 2) on August 4, 1935, about the project. 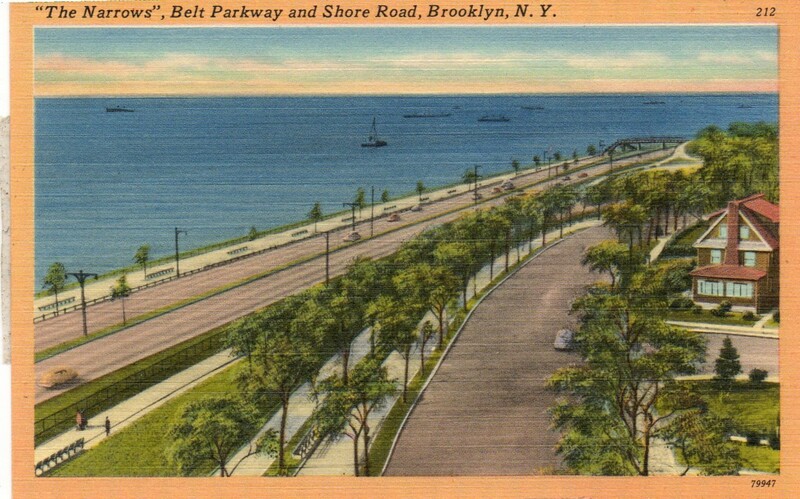 “Charm of Brooklyn’s Shore Road Being Revived as Park Project,” read the headline. Right now the banks of the bay below the Shore Road are badly in need of landscaping. Sweet clover and tall weeds overgrow the concrete walks installed by [the] former park commissioner…Here are there are patches of asphalt walk laid down by the present department. A couple of small baseball fields, a few improvised diving boards [?!] and the bridle path complete the picture. But Moses had still more in mind. In 1937, he released an $850,000 plan [$14.75 million, adjusted for inflation] to push back the sea wall, all the way to the bulkhead line, and add more landfill, creating an extra 23 acres of land for parkland and parkway. (Bulkhead lines separate, legally and jurisdictionally but not necessarily geologically, dry land from open sea.) The plan was endorsed by the borough president and the comptroller. And Moses revived the Olmsted firm’s 1895 idea for a waterfront bicycle path, because bike riding had yet again become a craze. “Figures for bicycle sales reached an all-time high of 1,300,000 last year ,” the Eagle reported, compared to less than 1.1 million in 1899. New bike paths were planned across city parks, including from Owl’s Head to Dyker Beach. By March 1940, work on the park was ready to begin. The $1 million [$17.5 million, adjusted for inflation] project, toward which the city hoped the feds would pay 60 percent, would employ 1,000 people of various trades for a year, the Eagle reported. The plans closely describe the park as it exists today, with some noticeable differences. New park benches every 10 feet apart, replanting and additional shade trees, with a number of pedestrian overlooks, including five children’s sand pits [which now must be those small, odd, fenced-in, boxy, overgrown lots that exist all along Shore Road?] 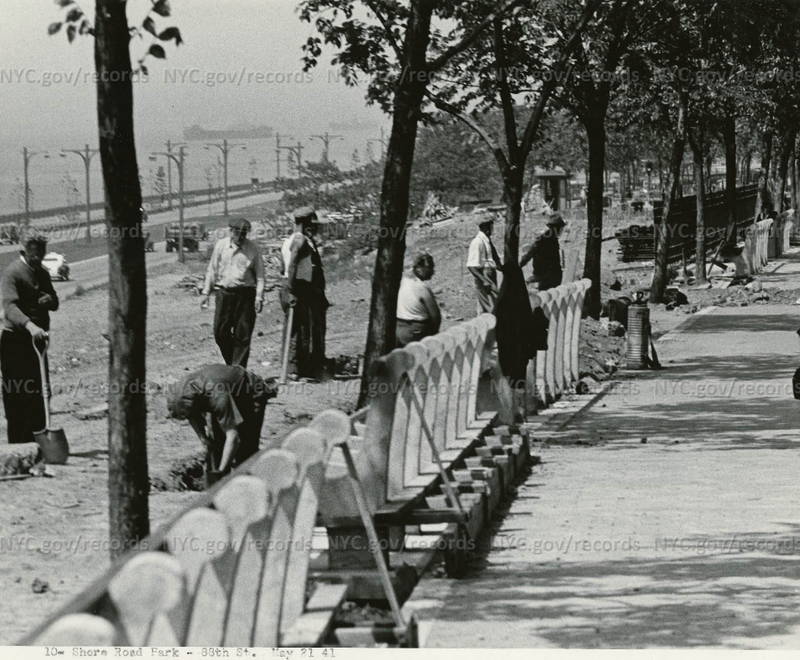 and realignment of the wrought iron fence, are called for in remodeling the old Shore Drive. Step ramps, 10 feet wide, leading to the sweeping walks, the ocean promenade or any of the five playgrounds and two athletic fields below are to be constructed at convenient points. The steep banks are to be covered with ground plants. Over 50,000 shrubs are scheduled to be planted in graded areas. Approximately 657 trees of the oak, maple and Oriental plane varieties for beautifying inside walks within this two-and-a-half mile link of the Belt Parkway are to be planted in single rows. The third playground containing a wading pool among other children’s facilities is to be developed between 94th and 95th Sts., which will lead into a large roller skating area. Between 95th St. and 97th St. the second athletic field is to be laid out like the first one. Provisions for the construction of an open-air dancing and roller skating area, approximately 150 feet long and 75 feet wide, are incorporated in plans for a fourth playground which is to be developed between 97th and 99th Sts., near 3d Ave. Other work in this section includes reconditioning of the existing comfort station and construction of a large concrete wall 280 feet long and 16 feet high to serve for retaining purpose and ten handball courts. The fifth playground, containing a children’s shower basin and nine tennis courts with other facilities, is to be built at a point where 3d and 4th Aves. converge. The program also includes the work of installing water lines, curbing, storm and sanitary sewers, electrical conduit and cable, and an automatic irrigation system. Manholes and sidewalks are to be constructed, walks paved and drinking fountains and park bench forms fabricated. Work began on April 8, 1940. Critics suggested that racism motivated Moses’s attention to Bay Ridge while he excluded other areas. 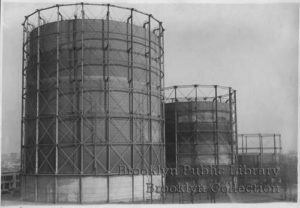 “It seems strange…that no efforts are being made to provide…much-needed facilities for the Bedford-Stuyvesant section,” read a letter to the Eagle in April 1940 by Emanuel Celler. While the density of children per acre in the Shore Road area is seven, in the Bedford-Stuyvesant area there are 14 children per each acre, and each child has less than one-half of one square foot per acre compared to seventy-two feet per acre for each child in the Shore Road district. 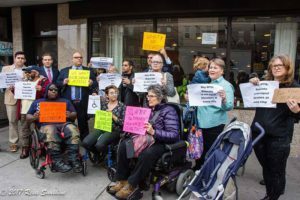 It is not only amazing, but disappointing, to learn now that a project for Bay Ridge is being advanced and being considered, while the Bedford-Stuyvesant area lies dormant and evidently ignored. 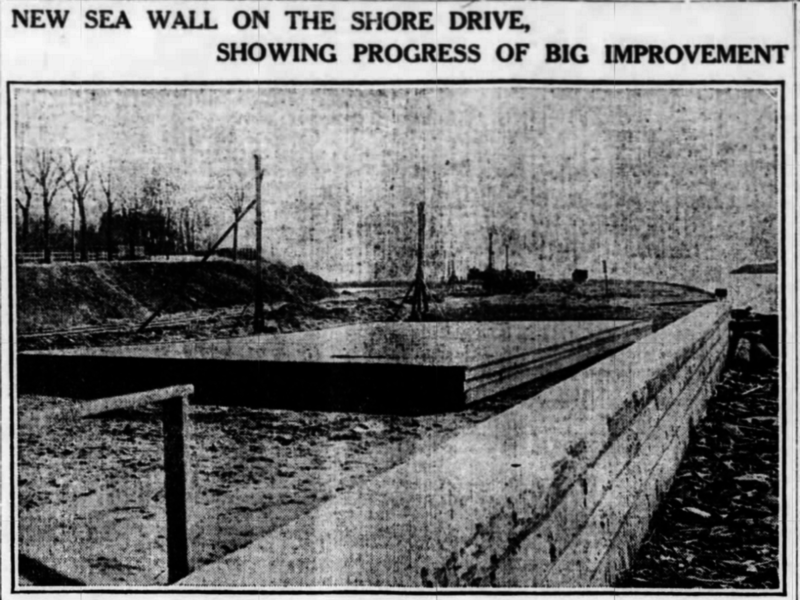 The highway portion was finished: paving, grading, the seawall, the overpasses and two gas stations, which no longer exist (similar, presumably, to the one that still exists near the exit for the Marine Parkway Bridge). The second stage involved the landscaping and building the playgrounds, as well as fencing and lighting and the construction of the bike path. 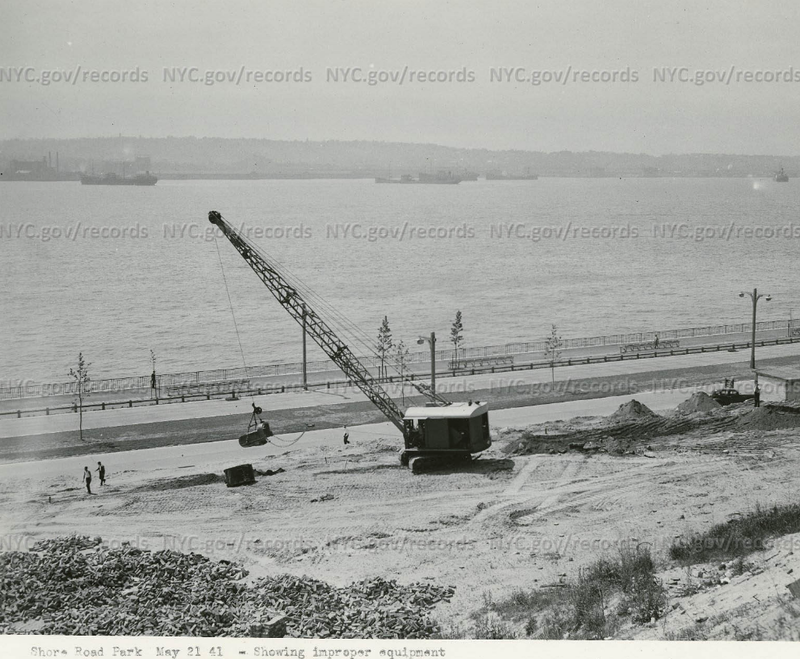 A large irrigated sand pit has been constructed in an offset of the promenade opposite 70th St. [possibly now the small pond across from Xaverian], and entrances to the lower area, adjacent to the Belt Parkway, have been set up at 82d St. and a point midway between 70th St. and Bay Ridge Ave. Wide, bituminous-surfaced walks lead to an oval, grass-surfaced play area developed in a bay formed by the curve in Shore Road. Benches and drinking fountains have been spaced at frequent intervals and a wrought iron picket fence separates the area from the parkway. Fort Hamilton High School opened a month later, in September 1941, where the Crescent Athletic Club had stood. And they did—today, almost the entirety of Shore Road is lined with them. Were Henry Ward Beecher resurrected and returned to the Fort Hamilton shores, he wouldn’t recognize the place—like, at all. I’m grateful that Bay Ridge has miles of waterfront parkland, a promenade along the coast, and a winding drive on the cliff above. But I also can’t stop pining for what might have been, had the previous generations’ leaders had different definitions of progress that weren’t dependent upon remaking nature into something you see out the window of your speeding automobile—or out your upper-floor living-room window. “Rarely am I irked by what strangers say, but irked I am,” an anonymous person wrote to the Eagle in June 1941. “What a rare and beautiful drive has the city built for us on Shore Road,” I overheard a lady say. Could she have known the Shore Road of another era? Could she have known the shrub-covered hills that gently rolled downward to meet the lapping waves of a wholesome beach? Or the fine shaded lane that bent easily into what was then the drive? Or the beautiful tree-hidden mansions that silently slept amid the sweet scented flowers and shrub of that peaceful day? I think not! Is the concrete and pavement of today a better thing than the dirt and gravel of a serener day. I think no. Great article, full of information (and sentiment) for someone who grew up along Shore Road (9511, built in 1957 on the site of the McCormack house – Mr. McCormack was one of the founders of Moore-McCormack Lines and he lived in one of the front apartments in the building so he could watch his ships in the Narrows). I went to Xaverian and regularly walked to and from school (sometimes schlepping a guitar AND and amplifier plus books – no idea how I did it). I live up on Cape Cod now but a trip back to “the old neighborhood” is definitely on my “bucket list”. Sincere thanks for the research! Does anybody play stickball in the handball courts any more? NOBODY plays stickball anywhere in Bay Ridge anymore. If you do come back to the old neighborhood, I’ve got a place on 72nd St. off Colonial Rd. you can stay at! Many thanks – we may just take you up on that! Maybe an email address would help – mine is bill@capeirish.com. Great article, however, the park area between 69th and 72nd street was never as bad/went to seed as has been mentioned. This is a modern myth perpetuated by a small collection of local yokels, dull witted chainsmokers, known drunkards and social deviants who frequent/hang out in the NBG. The old park I remember well was not bad at all ,in fact it was better kept, neater, more open and airy than than present day overgrown and overplanted parkland- thicket that exists today. Bklyn parks dept has been sold a bill of goods. MANY a Shore Rd.resident wishes the old park was still there. I think no.My dad remembers the days that he would walk from our house straight to the beach and into the water. His parents bought our house and the one next to it in 1921, Dad was born in 1922 his brother in 1923. I wish I was alive then to see the way it was.It is so fascinating to see the photos from that time when the land was still farmed and open grassy places were the norm instead of concrete.